After my last big build, I was trying to decide what to do next. I had settled on doing a steam plant with a generator and some lights. I was discussing the details with my chief engineer at work ( who likes to display my models in his office) when he threw out a comment along the lines of "I wonder if I can charge my iPad from it." We sat down and ran the numbers and figured out that charging an iPad would be marginal but a iPhone was completely doable. The original design concept called for using my PMR 3A as the engine. Unfortunately I have already given that away. 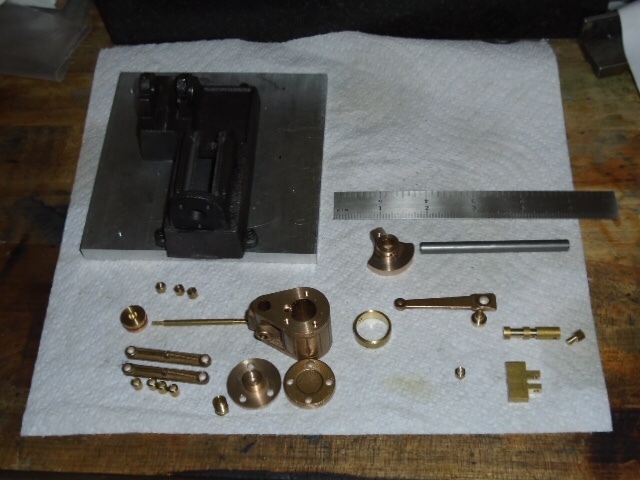 I dug into the closet of castings and found a partial set of 3BI castings I can make the rest out of bar stock. So that's the engine sorted. I also pulled out a PMR vertical boiler kit and a PMR generator kit. I started to design a 5 volt buck converter but it ended up being easier to just buy one online. I am currently working on the engine. 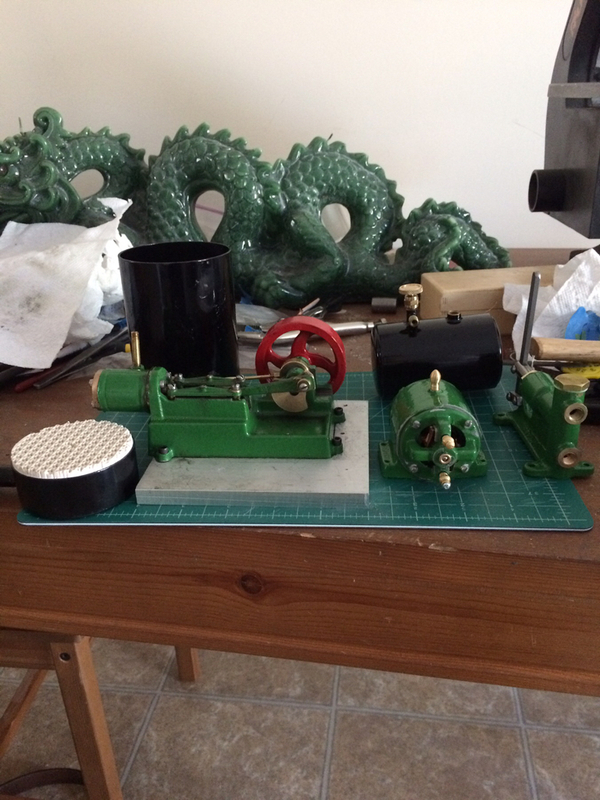 Since I have already posted a 3A build log I will just be posting status pics until I get the engine finished and I start the boiler. Here is where I am after this weekend. I want to see the look on people's faces when you mention in a meeting that your iPhone needs a charge, so you need to go light the coal fire in the boiler...! I've already been told that coal fired boilers violate company environmental policy so it looks like it will have to be fired on gas. At least leave a lump of coal next to it! Great stuff Tony! This will be fun to watch. Gives me ideas. 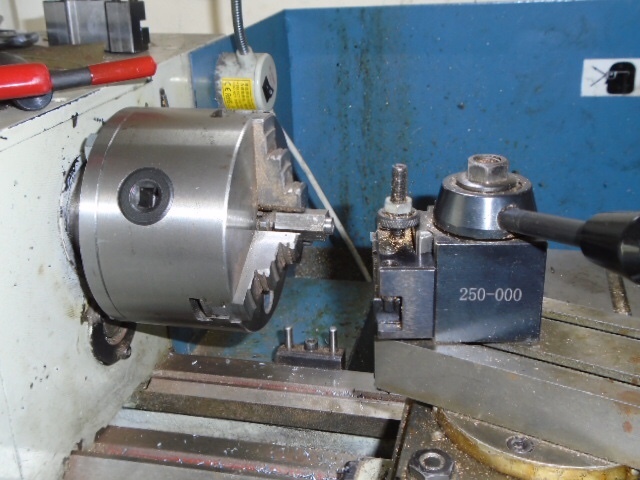 Maybe when I get my P & W Hit and Miss done I could power a can opener or mixer or something! That's going to be priceless! Oh...this should be fun Tony. I'm along for the ride too!! will this be finished by the time i need to recharge my 3310 ?? !! assuming there is no copywright !! It will be even more visually satisfying if you fuel the boiler with the smart phone. Sorry Marv, my company is very protective of their electronic leashes. Here is a quick progress update on what I got done this weekend. 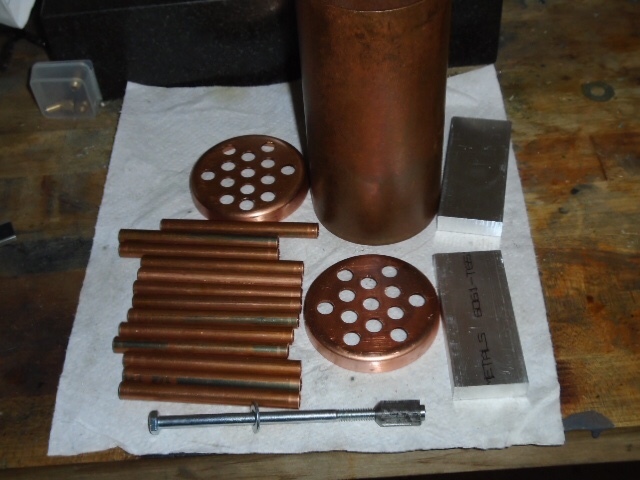 The cylinder covers are done, the piston rod and piston are done. 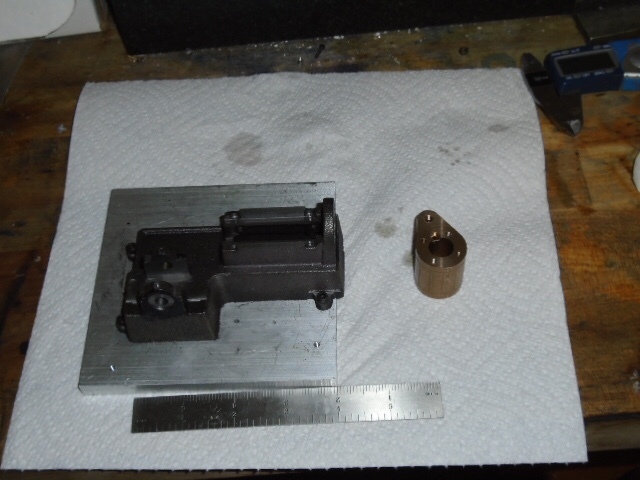 The packing gland nut is done and both crosshead guide bars are done. My buck converter also came in this week. Next up is the supports for the crosshead bar, the crosshead and the piston valve. The completed pile is growing Tony. A nice weekend's work I would say!! Nice start - you should be electrocuting, um, I mean charging, that iPhone soon! Time for a quick update on this project. Here is the current family shot. 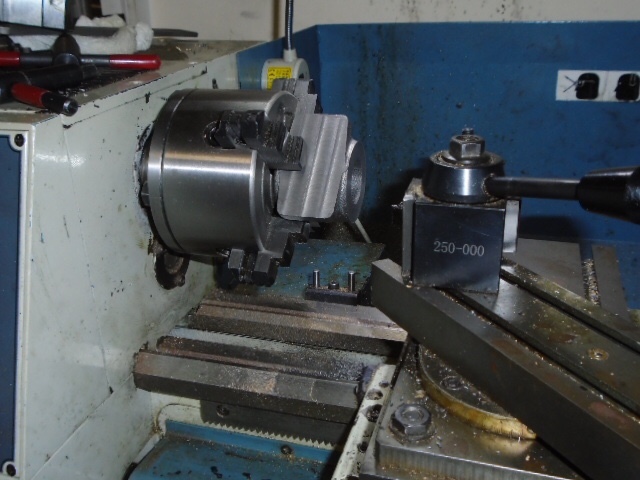 All I have left to machine is the flywheel and the eccentric. At that point, the engine will be ready to paint. I have a question for those of you that have made the PMR generator kit. 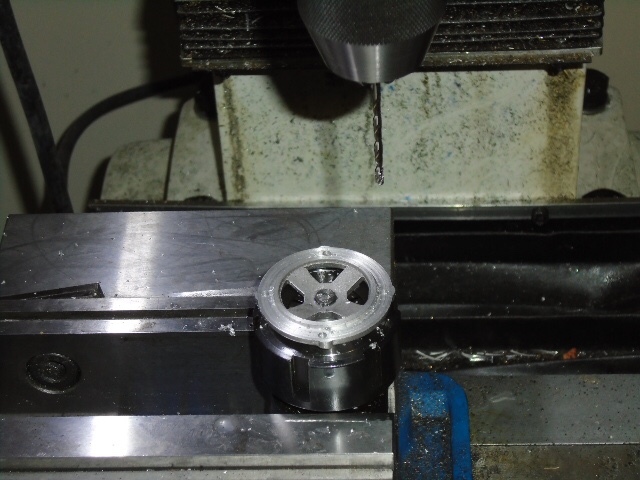 Should I cut a groove in the flywheel for the belt or can I get away with a more esthetically pleasing pulley? Your thoughts would be appreciated. I have started acquiring the required tools for the next phase of the project. 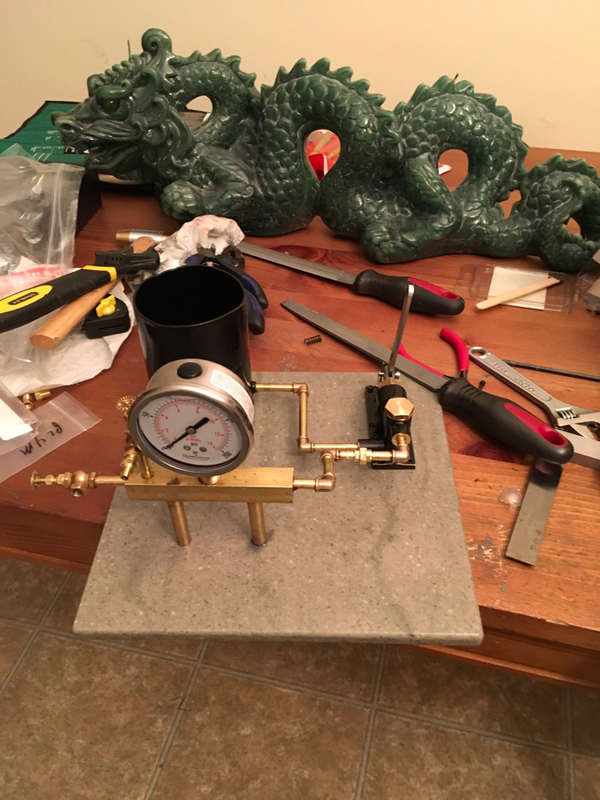 Before I can build a boiler I need to make a pressure test rig. 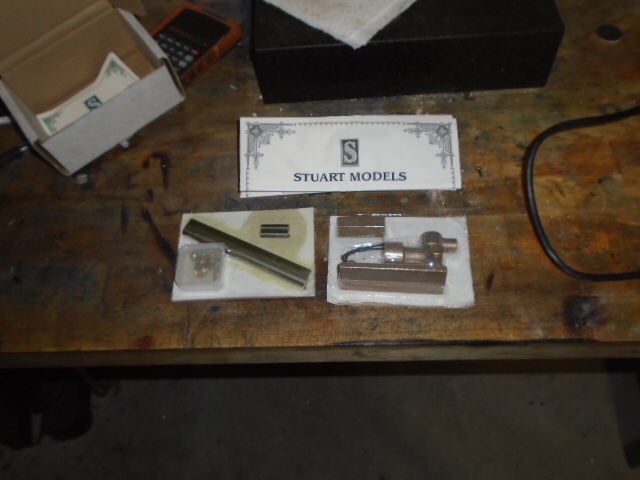 I have a Stuart hand pump kit and I will be getting a PMR water tank and pressure gauge to go with it. When I get started on that phase I will go back to my normal build log format. Looking good Tony. As for your question I would go with the pulley. 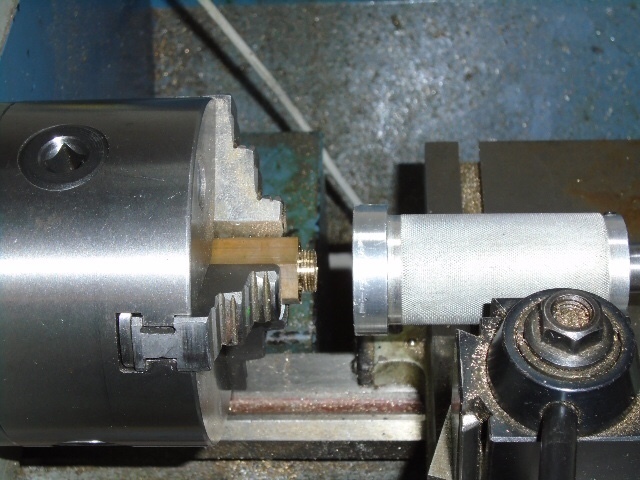 As I recall the crankshaft extends out far enough from the flywheel to make this addition easily. 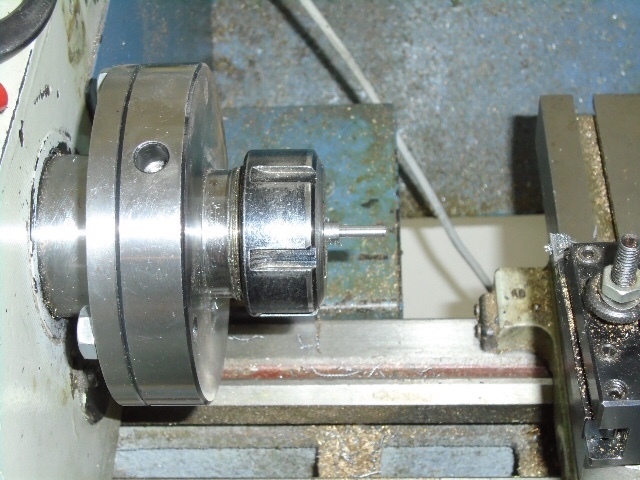 That way if you ever need to change the diameter of the pulley you can modify it or simply make a new one. Can't do that with the flywheel. Just my two cents. I took a couple of weekends but I got the engine running. Here it is running on about 3 psi. I decided to take Bills advice and not groove the flywheel. I will make a separate pulley when I make the generator. The next major assembly will be a PMR vertical boiler. 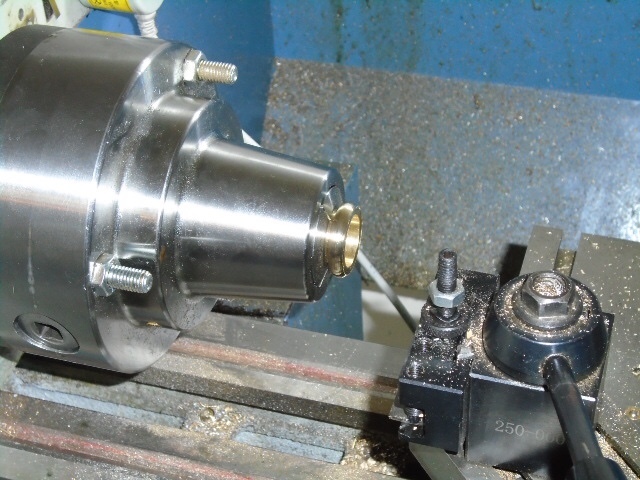 But before I make that I need to make a boiler pressure testing fixture. 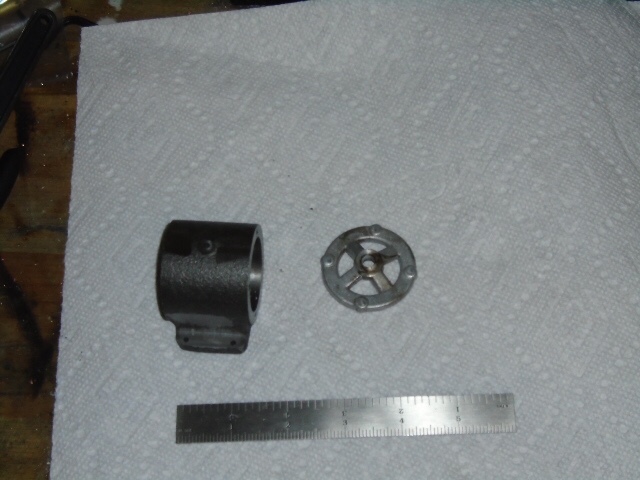 I have a Stuart hand pump and a PMR water tank that I will use to make the fixture. 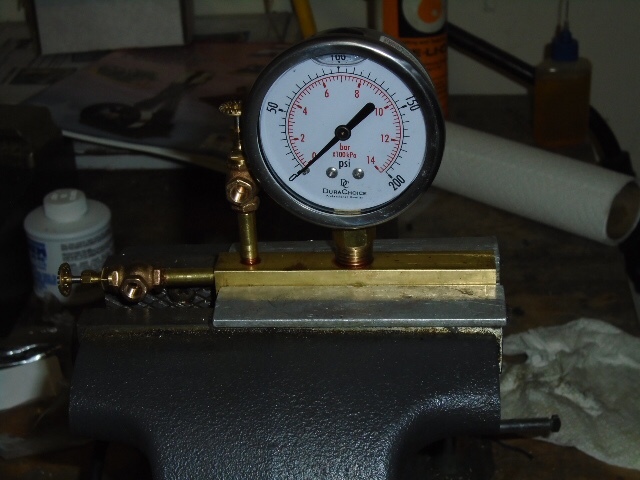 I also need to find a good 200 PSI gauge for the fixture that's sized appropriately for the 1/4 inch model pipe I will be using. Any recommendations on that would be appreciated. 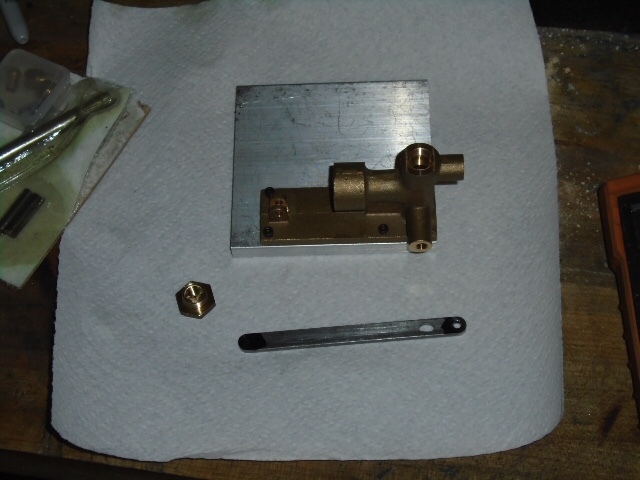 Plenty of pressure guages available, I'd just find one that has a thread you have a tap for, and make a short adapter to the model pipe thread - opens up lots more options on the gauge. 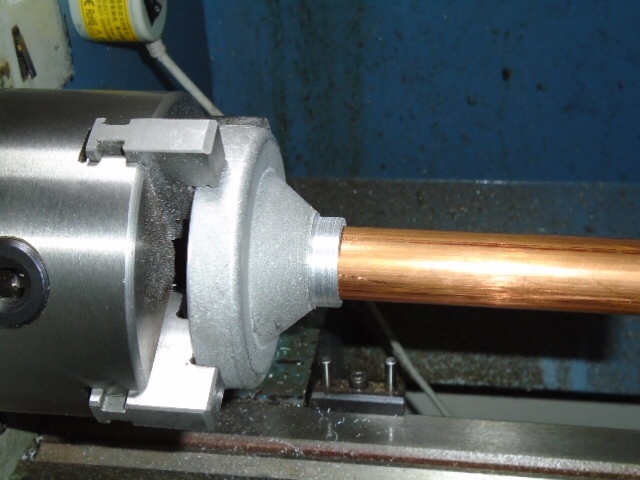 For your boiler test rig, I would suggest a larger gauge rather than a small one. A 150 mm dial is easier to read and calibrate. And with an adaptor to your preferred model thread, you can easily connect to other projects in the future. Keep the small ones for the model. I've been slacking on my posts recently so I think I'll take this opportunity to get caught up to where I am in the build. 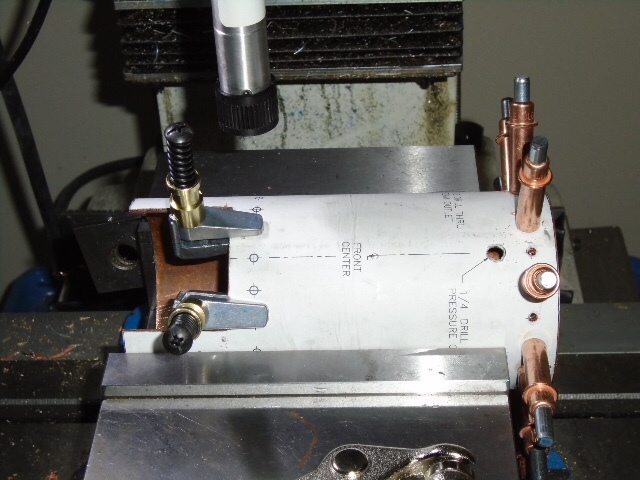 With the engine completed I need to make the boiler pressure testing fixture. I Started with the water tank. The tank I chose was the one from PMR. 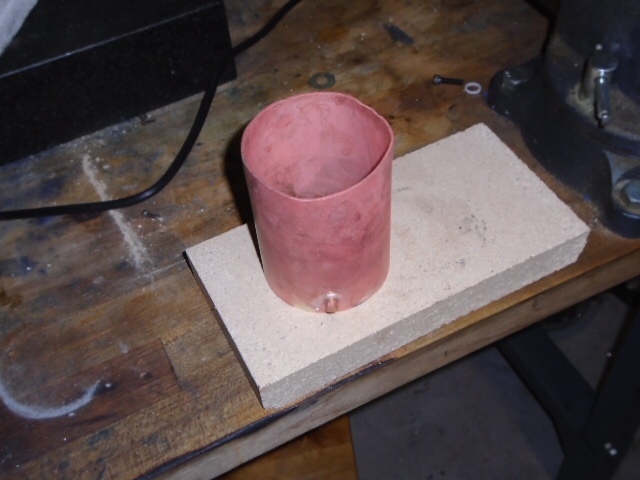 I started by sanding the preformed tank bottom until it fit in the tube. Next I drilled the tank for the outlet fitting. 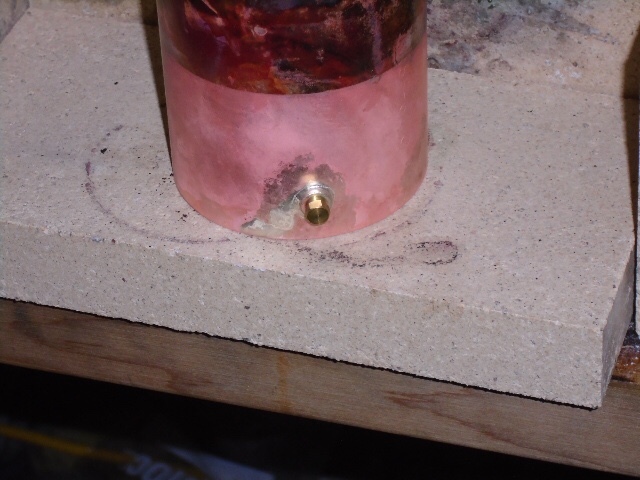 The fitting was hard soldered into the side so that it wouldn't melt when I soft soldered the tank bottom in. 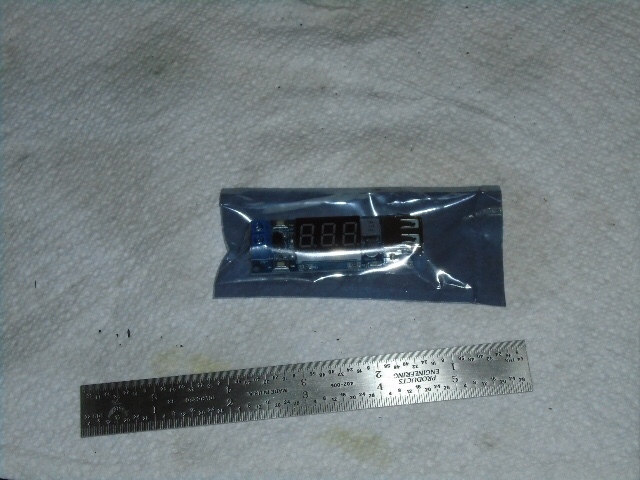 Then the bottom was soldered in using some of the PMR solder I ordered. 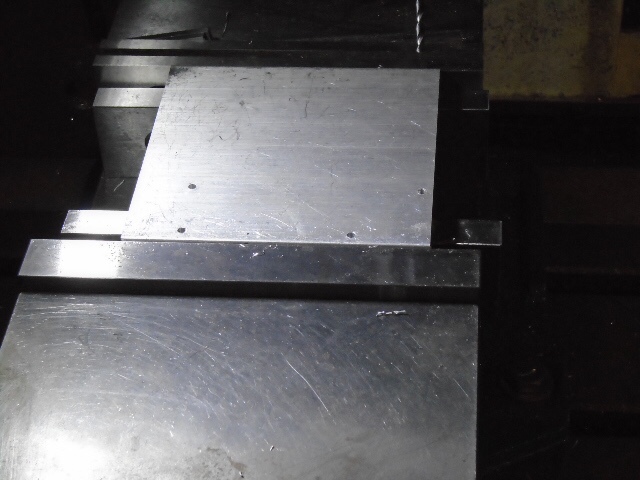 The bottom was faced off and the mounting feet were drilled. With that done I deviated from the plans by JB welding the base casting onto the tank. Here it is cured and ready for painting. Next up is the pump. I will be using a Stuart hand pump for the job. Here's what comes in the box. 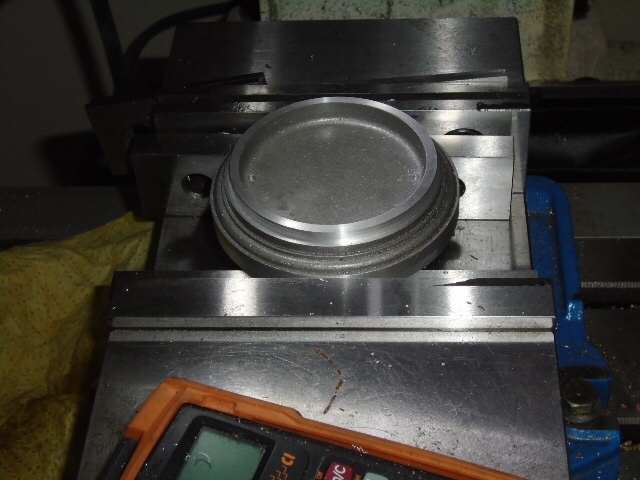 The first thing I did was flatten the base of the pump casting. 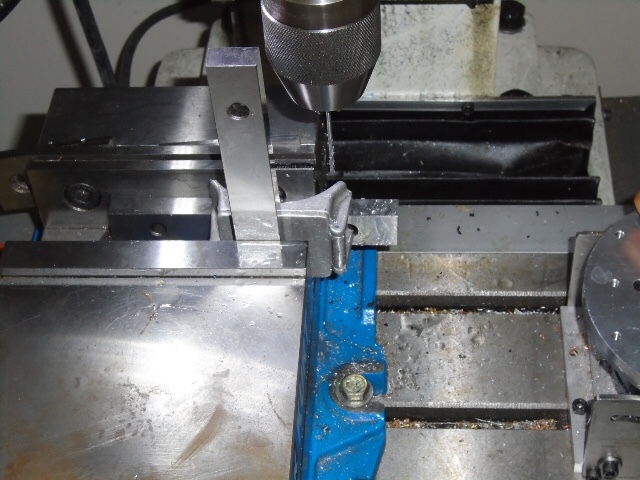 Then the mounting holes were drilled. 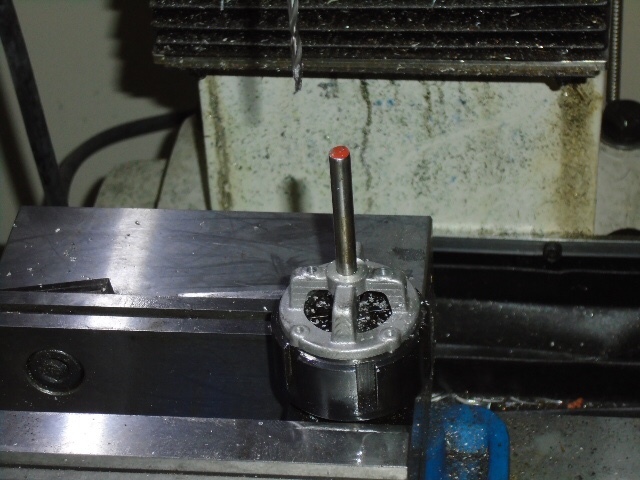 While I had the casting correctly oriented and centered in the DRO I milled out the handle pivot boss. As you can see the boss is not centered in the casting. 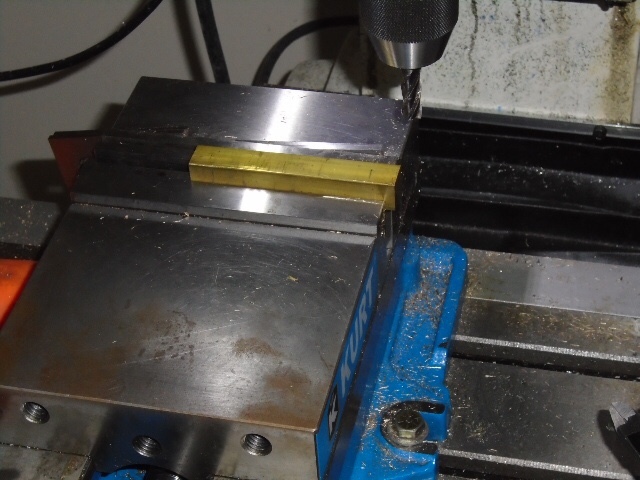 Next I transfer punched the holes to one of my tooling plates. 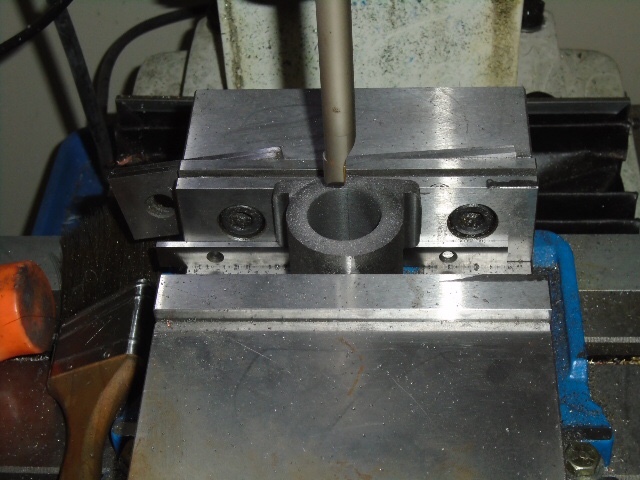 The tooling plate was drilled and tapped to take the casting. 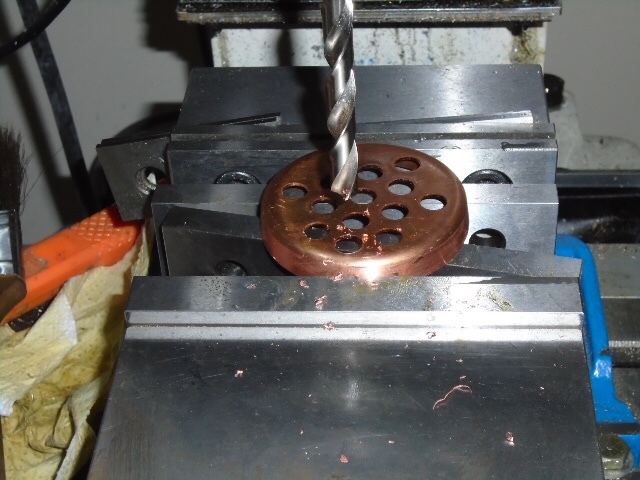 The casting was mounted to the tooling plate and the area for the valve bore squared up. 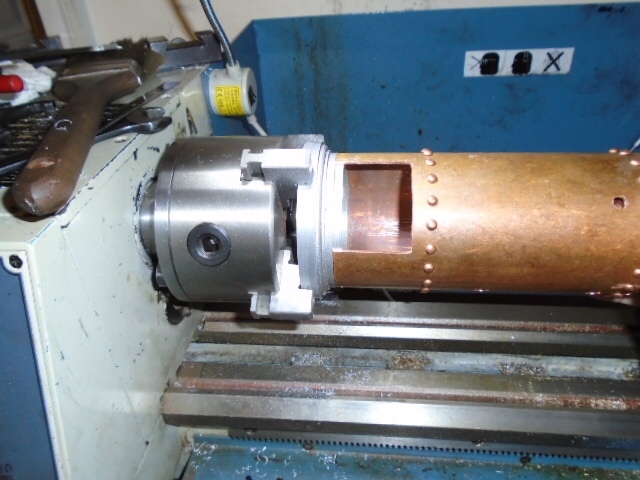 Next the bore was step drilled to size. The top was tapped for the plug. 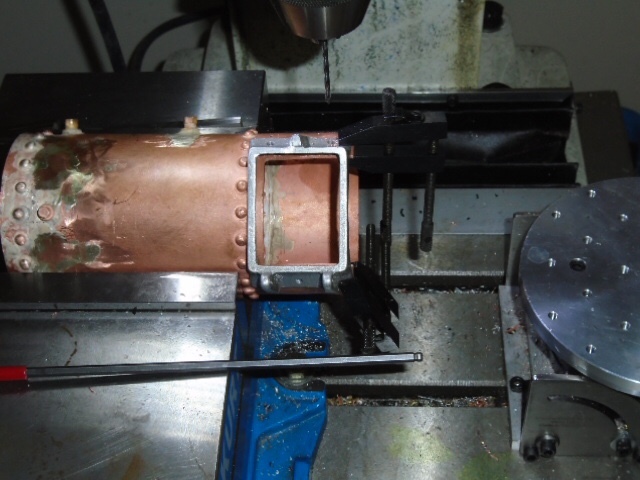 Next the inlet and outlet ports were step drilled and tapped for 1/4 inch pipe. 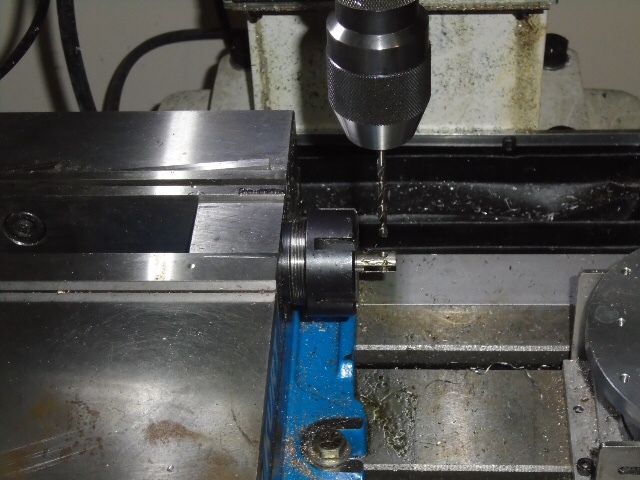 I started to do the piston bore but I realized that I didn't have the correct size tapping drill for 5/8 BSP. So the rest of the casting went on hold and I started the caps. 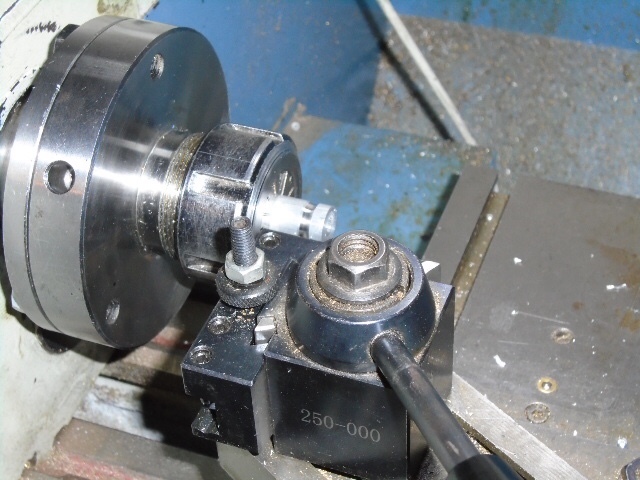 The first cap was for the valve bore. 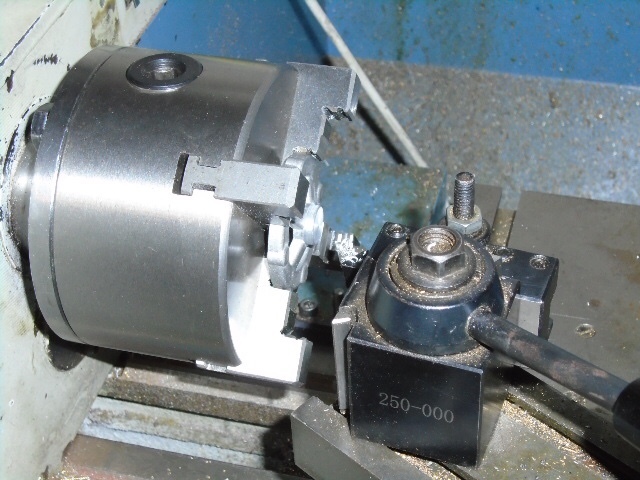 The supplied hex was chucked up and profiled on the lathe. Then the end was threaded. 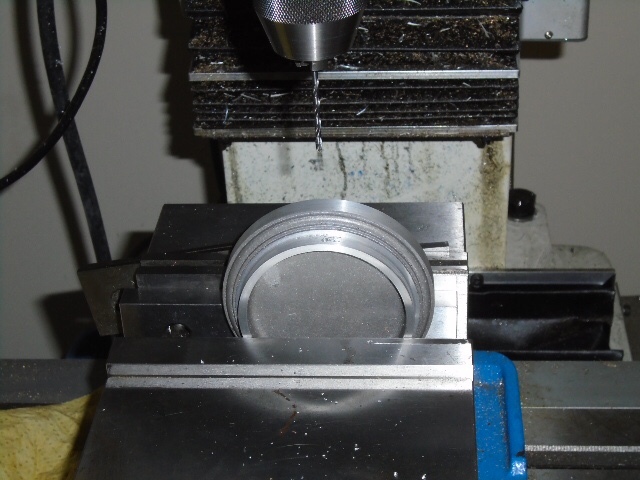 Next a 3/8 dome was drilled into the cap per the plans. The cap was then parted off. 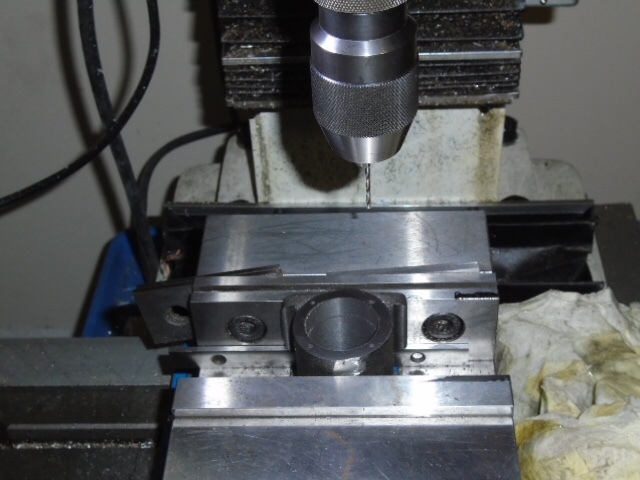 I started on the cap for the piston bore but I realized that I don't own the required 1.5 inch die stock to thread it 5/8 BSP. That one also went on hold. Next up was the handle. 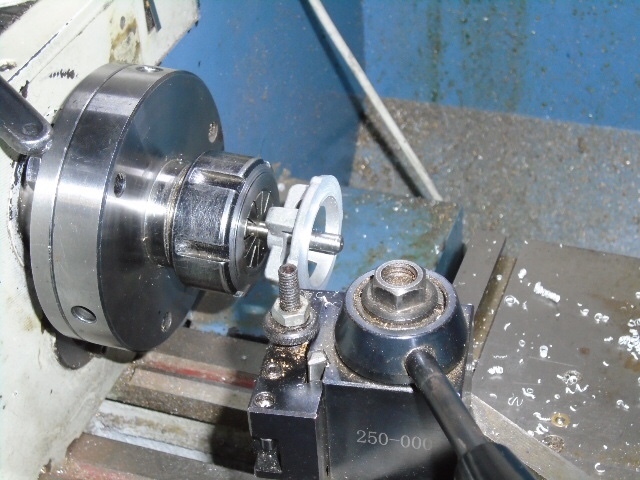 It was trimmed to size and the pivot hole was drilled. Next I cut the slot further up the handle. 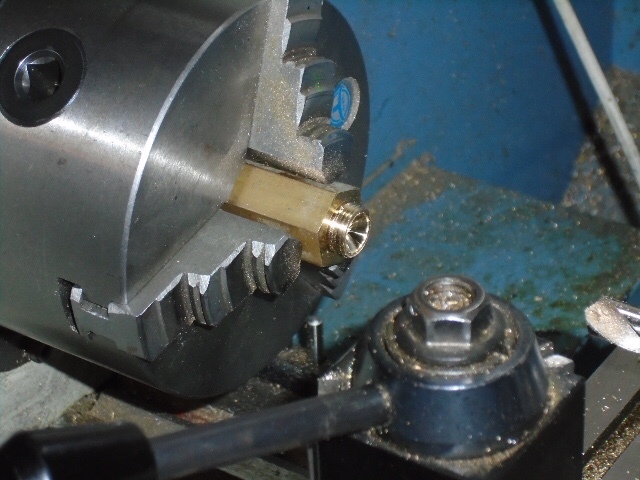 The part slipped while milling the slot so I have some cleanup to do on the slot. I rounded the ends of the handle on the belt sander. With that I called it for the weekend. I'll leave you with a family shot of the pump. Time for the next update. I received my 1 1/2 inch die stock so I decided to make the cap that holds in the ram. 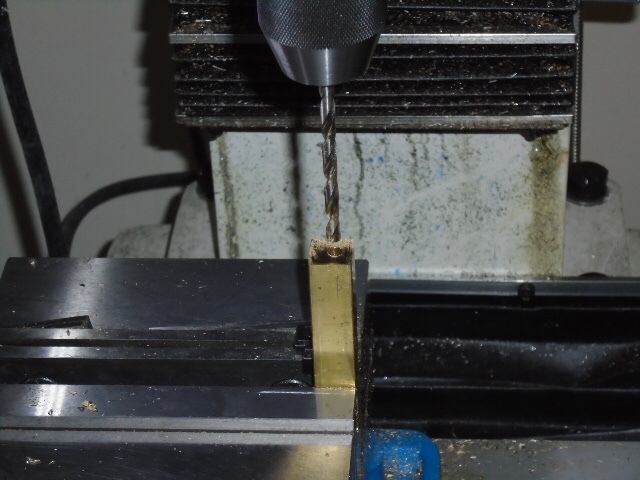 A piece of hex stock was chucked up and drilled. Next the outside was turned down for threading. 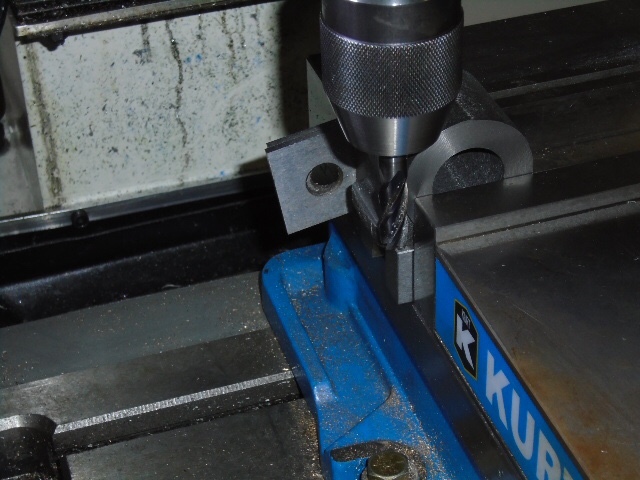 Then the new die stock was put to use cutting the thread. The nut was parted off and put to the side. 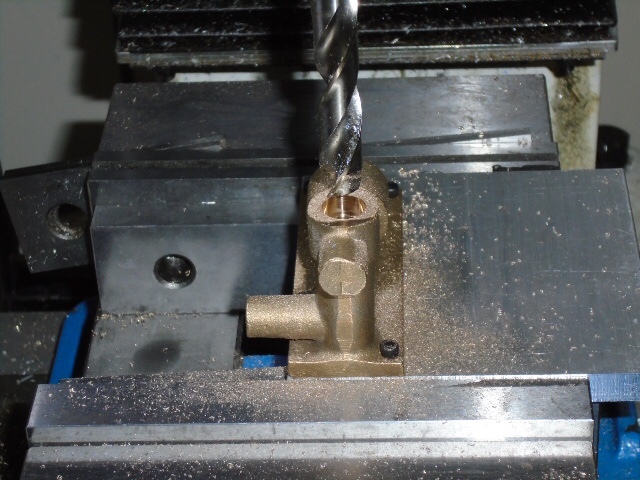 I also received the drill I needed to make the matching hole. First the base casting was remounted in the mill and the casting faced. 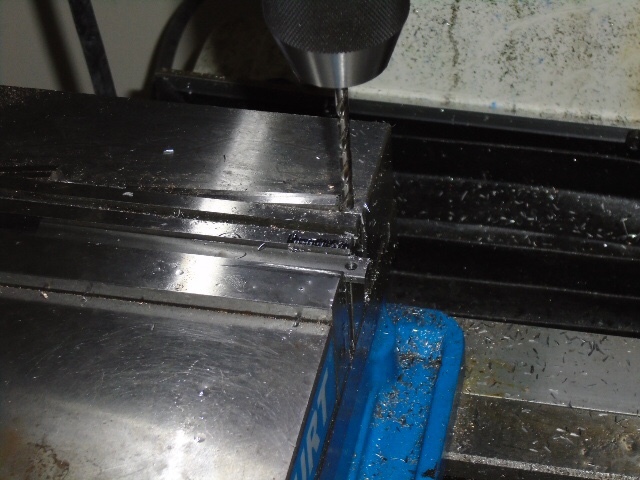 Next the required holes were drilled. While I doing this operation I ran into one of the things I don't like about working with castings. The location of the hole is in the dimensionally correct location to intercept the other holes but it's not in the center of the casting. It bothers my sense of symmetry but in this case there is nothing I can do about it. 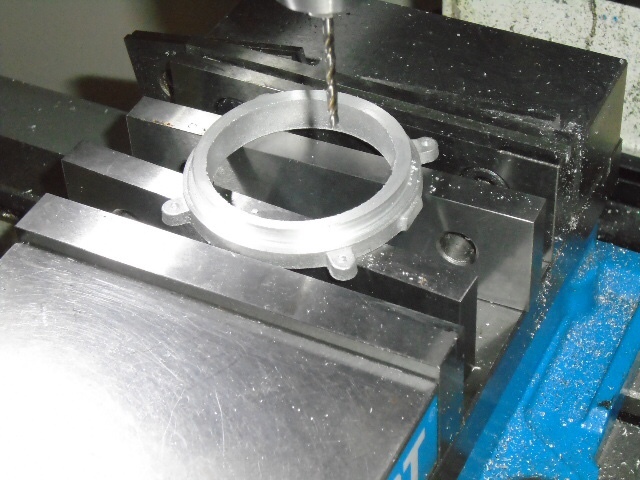 The last operation on the base casting was to tap the hole for the part I made earlier. The next part was the ram itself. The stock was cut to length, faced on both ends and then cut with a slitting saw. The widest slitting saw I had was 1/8 of an inch which is to small. 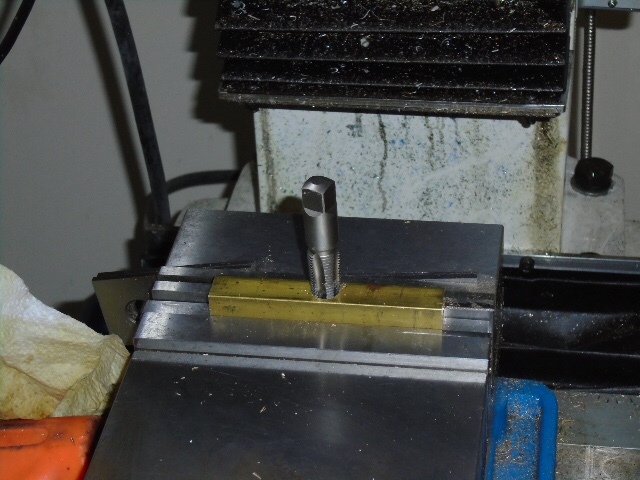 The slot was filed to fit the handle and then the hole for the pin was drilled. 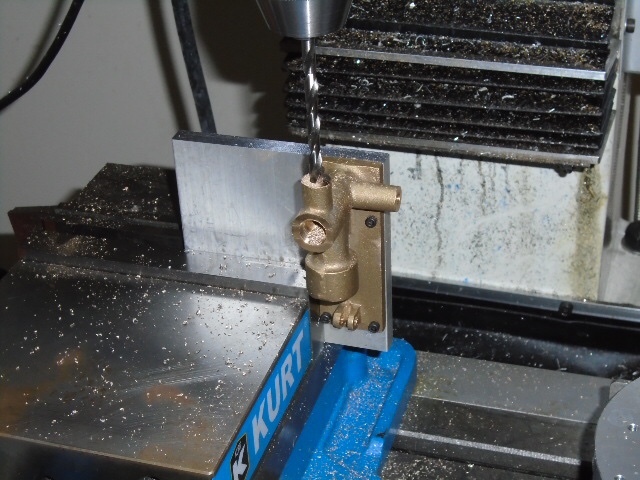 The last parts made were a pair of pins that were turned to the required profile, drilled and parted off. 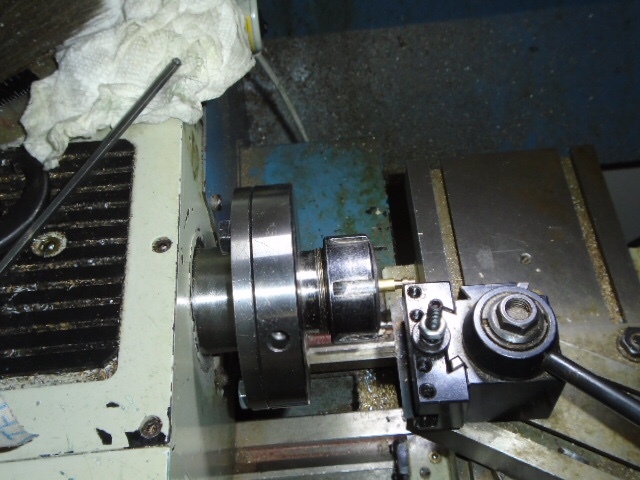 That completes the machining of the pump. A final family shot is included below. Next weekend I will paint the pump and the water tank. I also need to order a gauge, make a manifold and see about getting them plumbed up. You have been busy Tony and it's good to see an update on this project. 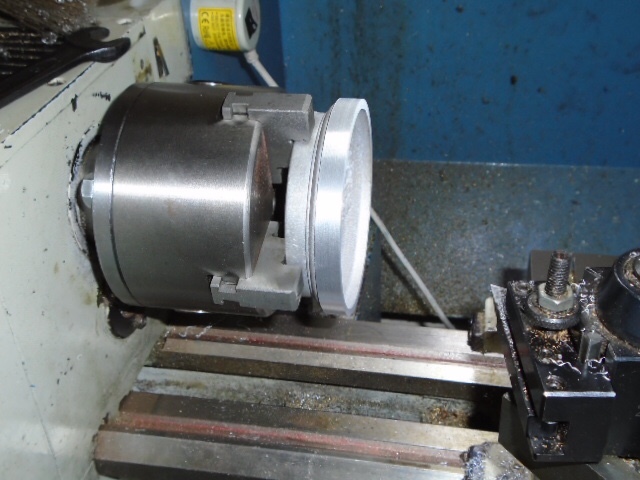 Maybe you can turn a round piece of wood or aluminum to fit the top and round it back out again. Just a thought. Thanks Bill, the evil work thing has been severely limiting by shop time recently but I'm trying to keep the project moving. Brian, oddly enough the numbers say it should work. It probably won't set any records for charging speed but it is only intended as a display piece to allow my chief engineer to impress our millennial minions and make a point about not being afraid to reach into the past for concepts that can be adapted to fit the needs of the present day. 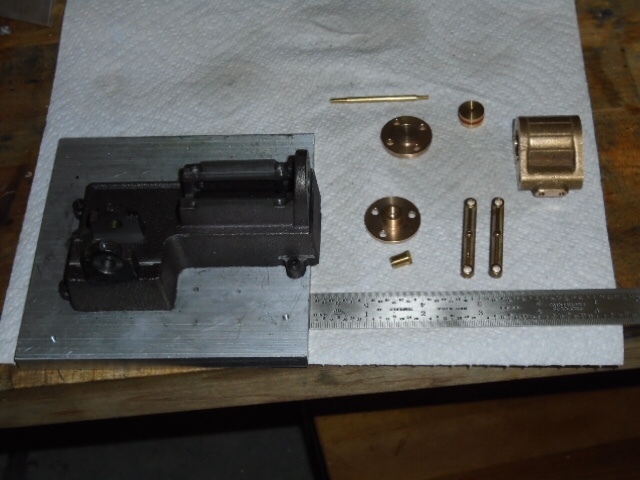 When I left off the pump was machined and ready for paint. Here is the completed pump. Next up is the manifold. 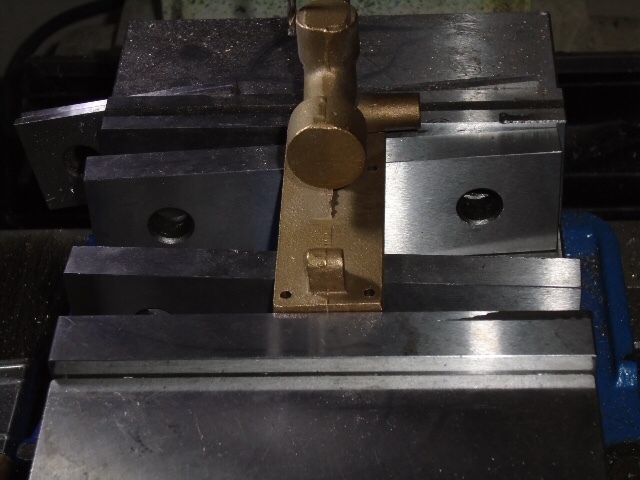 I started with a scrap of 3/4 inch brass bar and cleaned up the ends. Using the DRO I found the center of the bar. 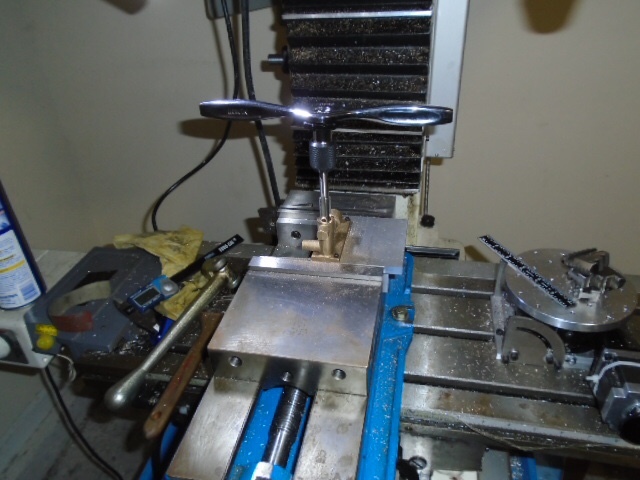 From there I drilled and tapped a pair of holes for the standards. 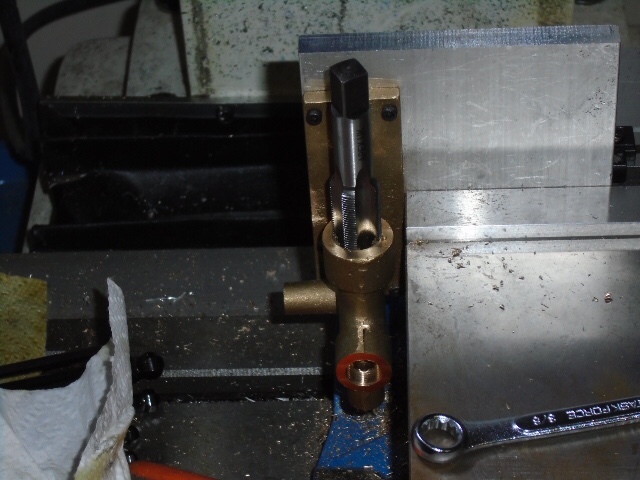 Next I drilled and tapped the passage through the center of the bar from both ends. The intent is for one side to be the inlet from the pump and the other end to have the outlet valve. 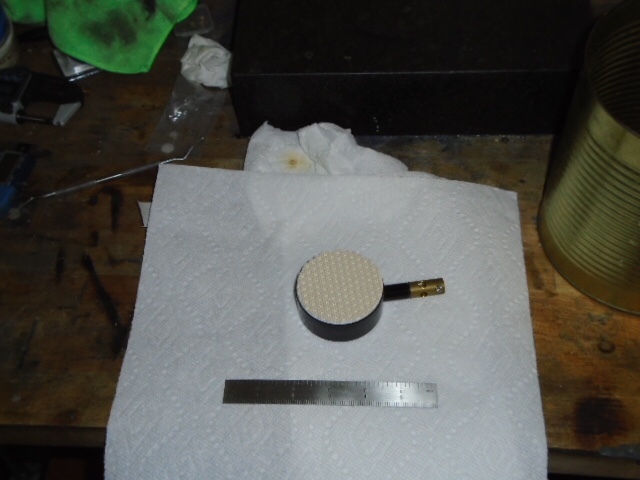 Next I drilled, taper reamed and tapped the hole for the gauge. At that point I realized I had made a fundamental mistake in the design. I hadn't put in a way to release the pressure. 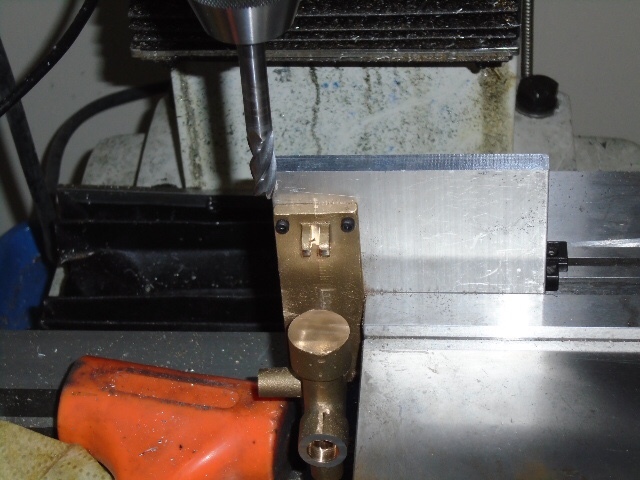 I decided to drill and tap another hole for a relief valve. Next up were the mounting standards. 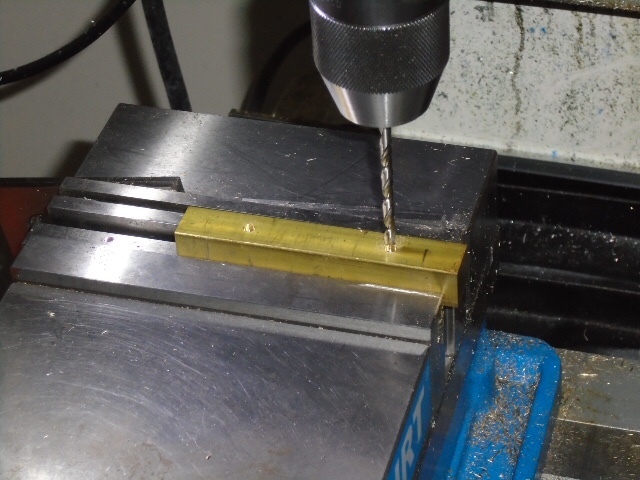 Some scrap brass rod was cut unto 2 pieces and turned to the same length. 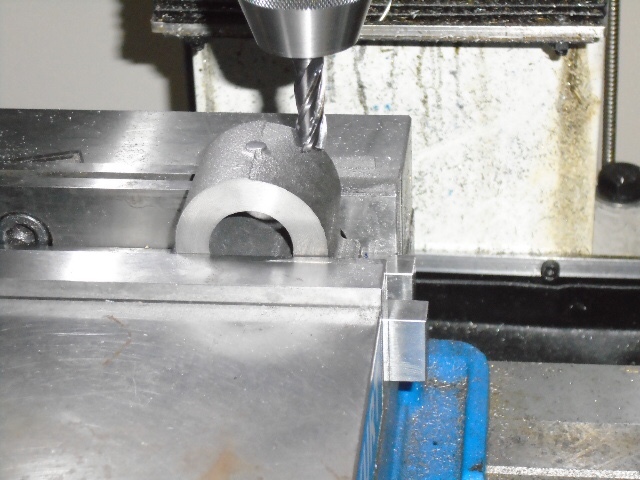 One end was drilled and tapped to take mounting screws from the base. The other end was turned down and threaded to fit the manifold. Next it was time to plumb it all together. 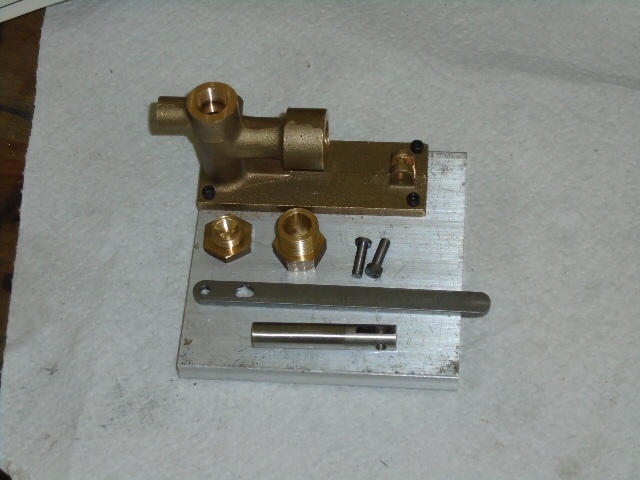 First I assembled the manifold. Then I laid out and drilled the mounting holes for the components. That was a big mistake because I didn't account for the variability of the screw joints in the pipes. I should have mounted one component, plumbed the parts together and then drilled the mounting holes. 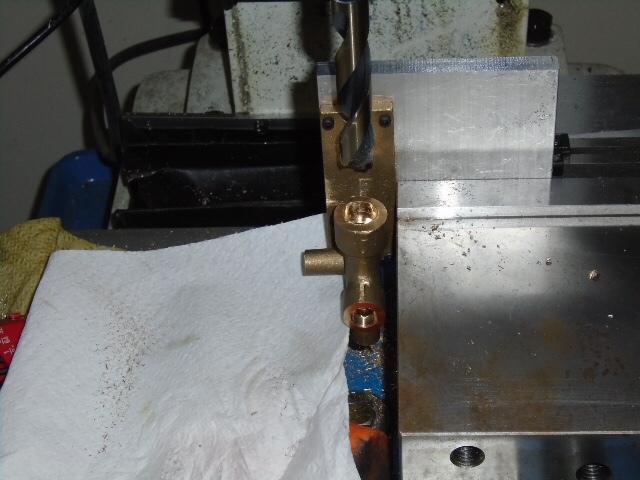 I also screwed up when counterboring the holes for the manifold. On one side I went too deep and punched through. 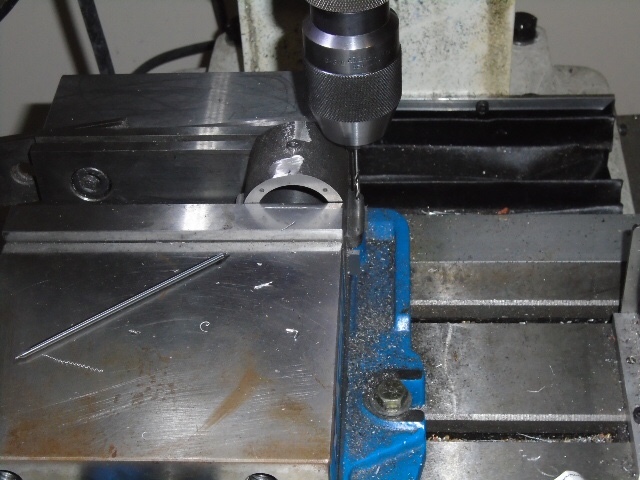 I ended up JB welding the hole and drilling it again. Here is a picture of the assembly as it is now. Testing shows that the system will build pressure but I am currently working through some leakage issues with the pump that prevents the system from holding pressure. While I was waiting for my check valve, I decided to get started on the boiler. 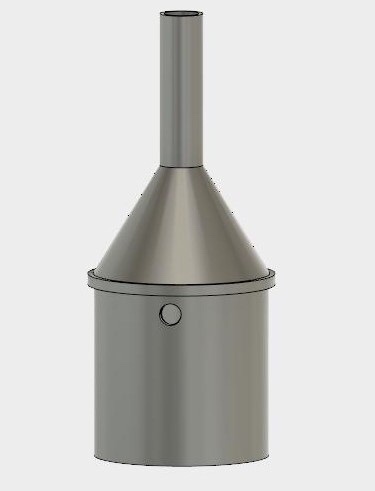 Specifically I will be making the PMR BLR-1 vertical boiler for this project. The first thing I did is cut the boiler tubes to length. Then both end plates were turned to fit the boiler shell. 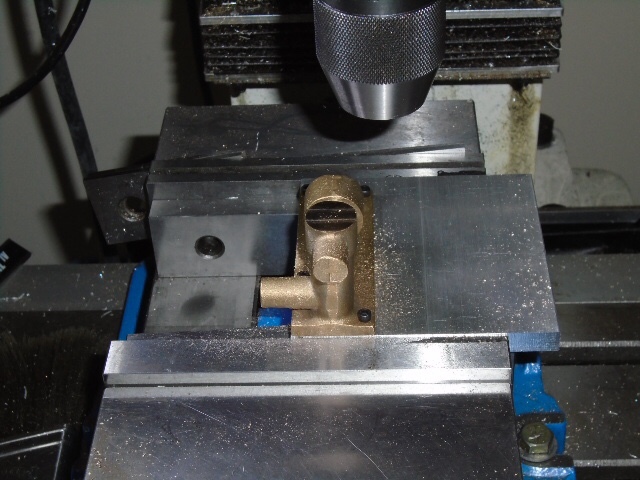 According to the plans, I needed an extra hole in the top plate to take the safety valve. So that was taken care of. 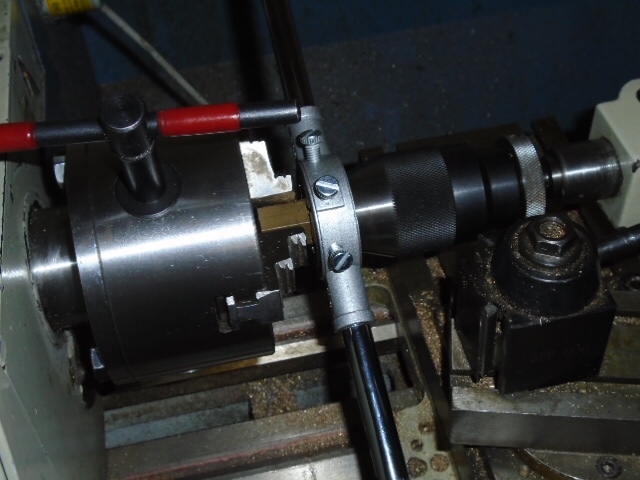 Next up it was time to make the swaging tool for the fire tubes. 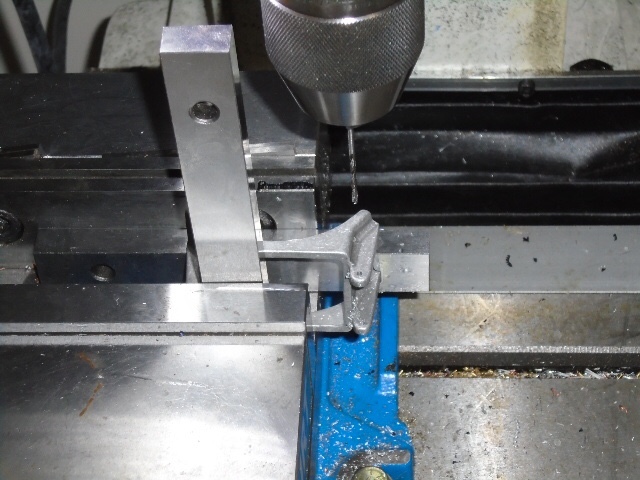 The supplied hex stock was faced on both ends, drilled and tapped. Next the final forming side was turned to dimension. 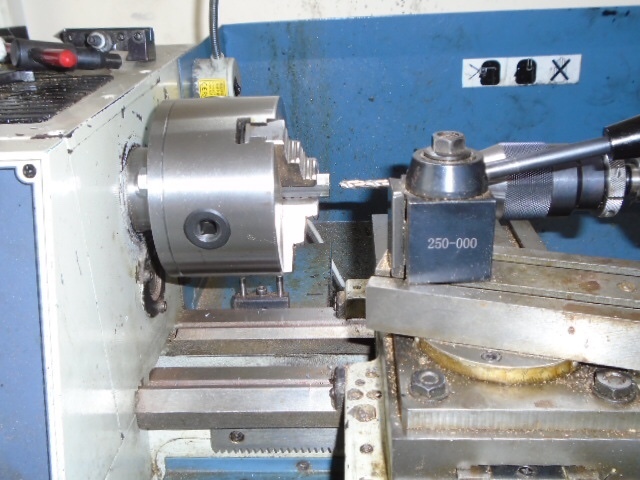 The part was flipped and the cross slide was adjusted to 45 degrees and the taper cut. 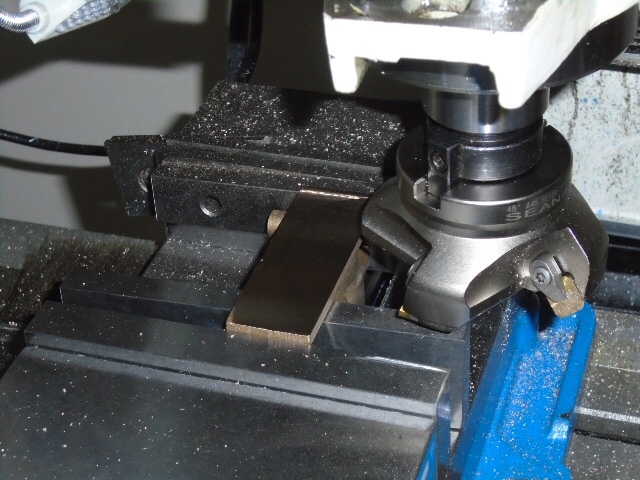 Next I made up a pair of matching spacer blocks to set the spacing between the end plates. Here's a family shot so far. I'll end this update with some swaging in progress. I have that kit and it's on my 'todo' list. I hope to see more of your progress. Me too! Interesting to see it go together. What will you use for a burner? Come to think of it I do too....very well aged by now too!! Along with the all bronze coke bottle engine, equally well aged. Thanks guys, Chris I'm not sure what I'm going use for a burner. Most likely I'll put in a bix burner. I just caught this. I'm with Brian it's a great steam punk sort of idea. I love the concept. Time has been limited this weekend but I did finish getting the tubes swaged. 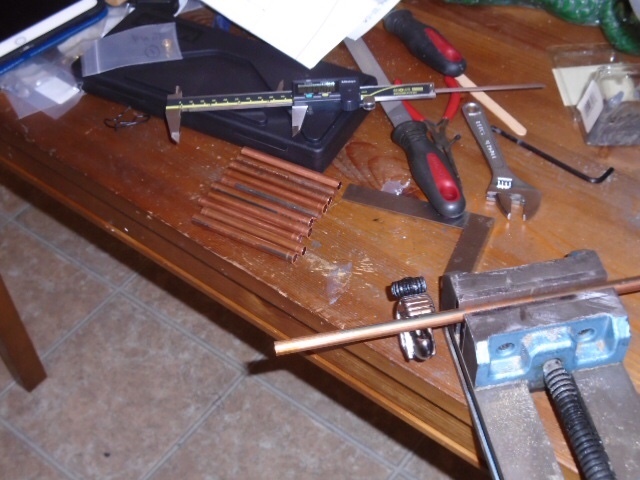 After looking at my swage job I decided I better hard solder the tubes in just in case. 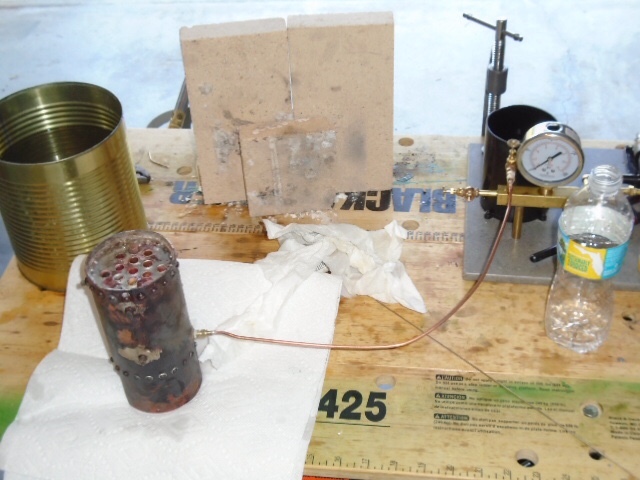 Here is the fire tube assembly out of the pickle. Next up I will drill the main body and start riveting. Tony that looks good,looking forward to each update here. What kind of equipment did you use to do the soldering? Zee, I used a basic bernzomatic torch with a propane tank in it. I didn't even need to bust out the tank of map gas for the job. 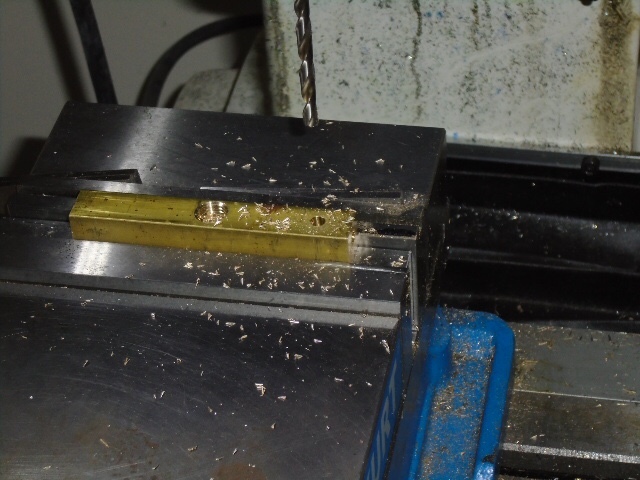 The solder was siverflow 55 solder with tenacity 5 flux. It took quit a while to come up to temperature but tenacity hung right in there without burning. It's good stuff. I always wonder if I have the right tool for the job and would hate to get half-way in, ruin the job, and realize I had the wrong tool. Is that a small belt sander behind the flux Tony? More pics if so please. 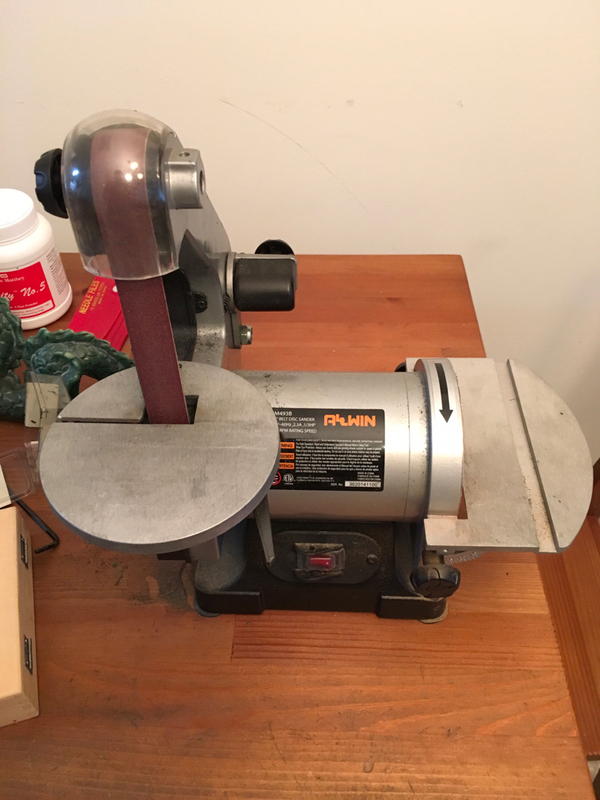 As requested, here are some pictures of my 1 inch belt/disk sander. It's not bad for a light duty unit. You can get the them on Amazon for about $100. 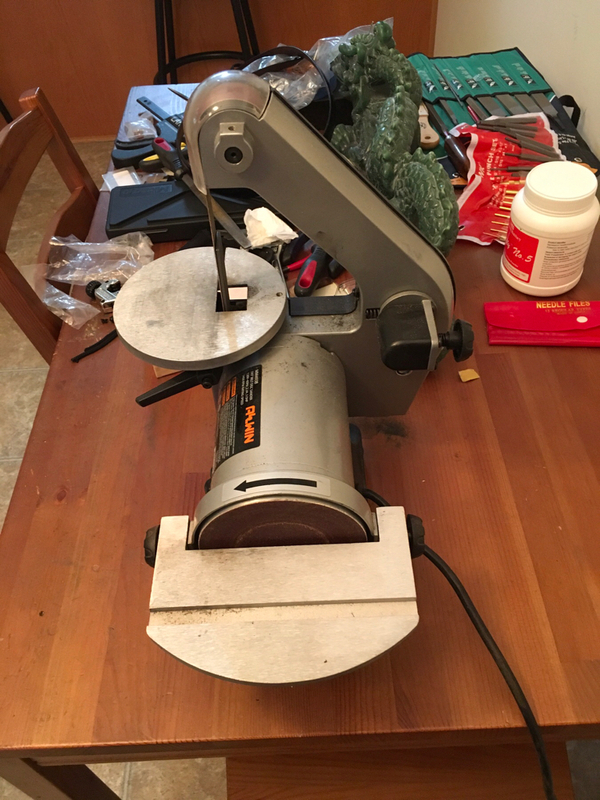 I have the Dremel version of that sander, very very useful for rounding the ends of small parts without setting up the mill and rotary table - use it a lot. Thanks Tony, it has a nice small footprint which I like. 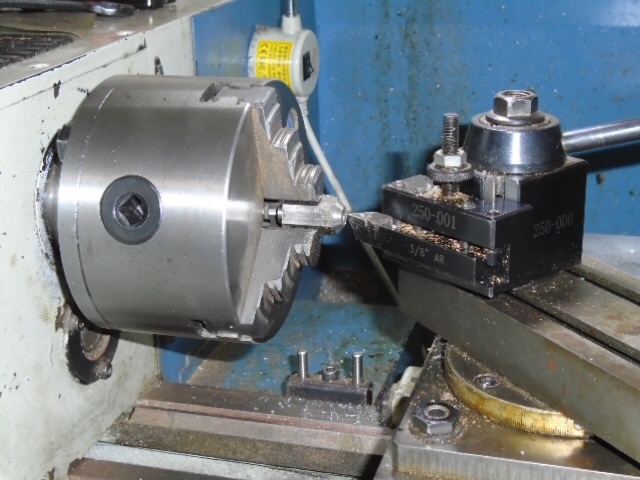 Oftentimes don't need a more powerful unit for rounding small parts like Chris mentioned. Time for the next update. With the tubes soldered it's time to work on the shell. I glued the template to the shell and drilled all of the holes for the bushings and the mounting screws. I also drilled the corners for the firebox cutout. 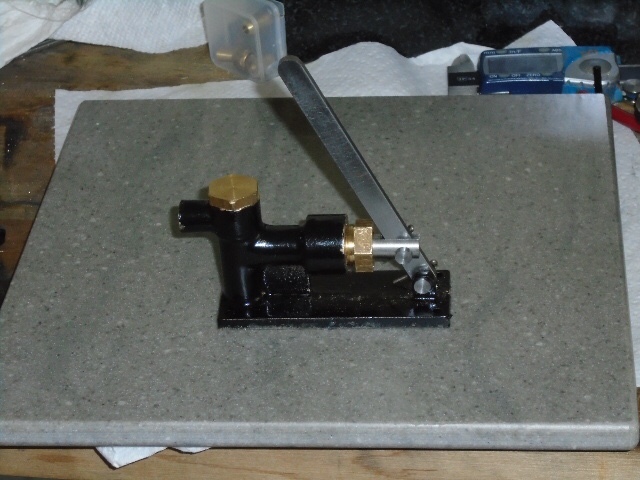 Next I spent some quality time with my jeweler's saw to cut the firebox opening. 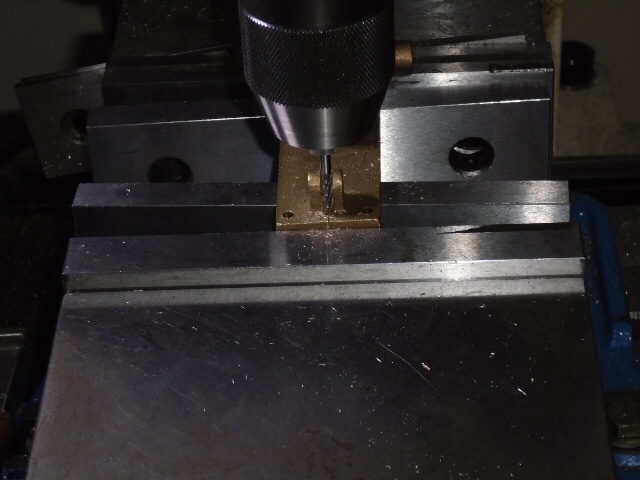 Then over to the mill where I picked up the rivet holes using the laser and then drilled them. 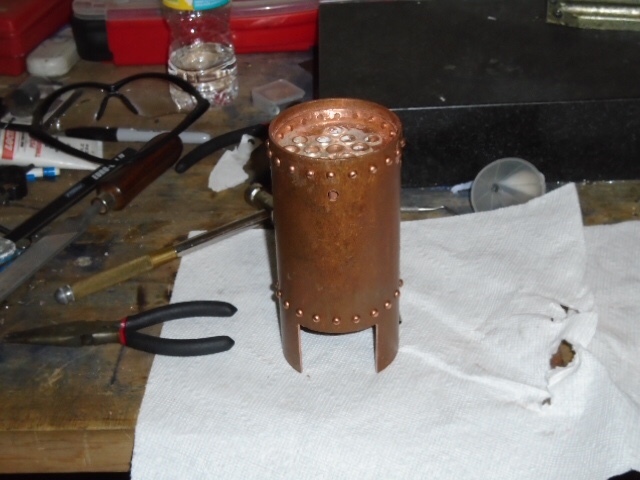 Here is the boiler with all of the rivet holes drilled. 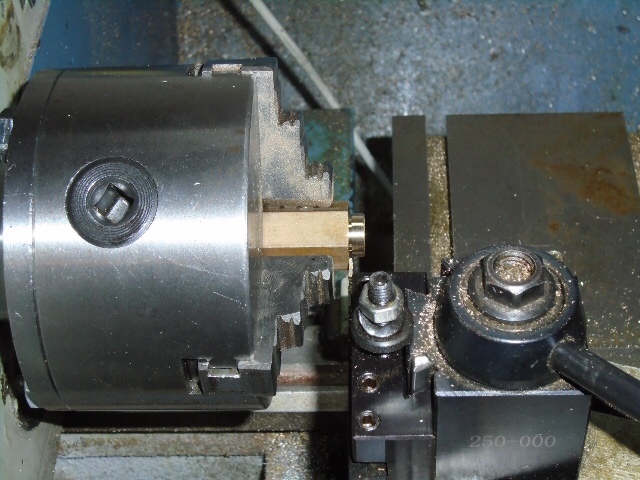 Now those who have made one of the PMR boilers may be wondering why I haven't made the riveting tools called out in the plans. The reason I didn't make them is I have a secret weapon from my aircraft mechanic days that is perfect for the task. 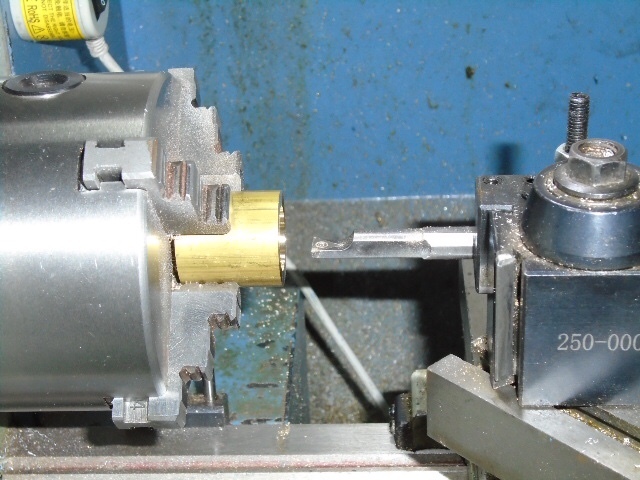 Meet the rivet squeezer. 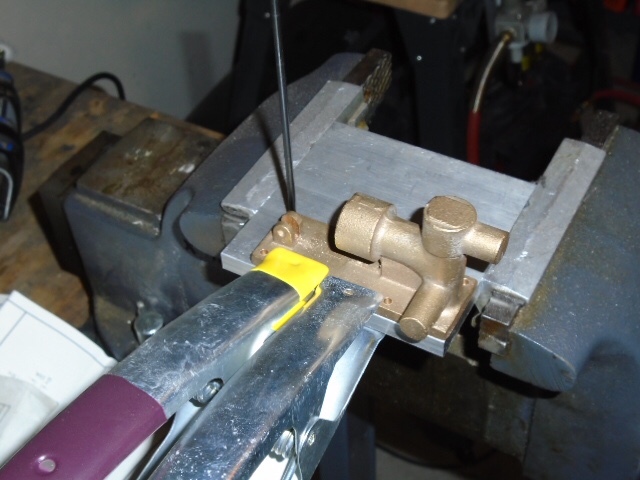 I hade to bust out the big anvil but the tool made short work of riveting the boiler. I mean that literally, it took a little more than a half hour to rivet the boiler together. Here is the final result. 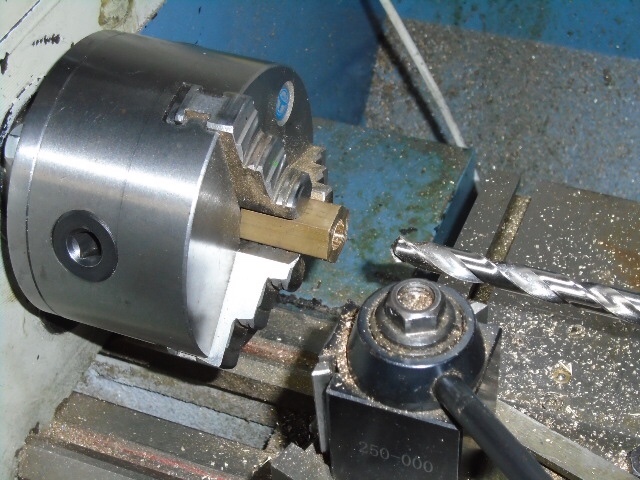 I had made one of the rivet squeezers, copying the one Florian did - they are very handy as long as you dont need to get too close to a corner. What are those post thingys holding the parts together till they are rivetted called? I've seen ones like that used in pictures of airplane factories, and there is probably a better name than 'post thingys'! 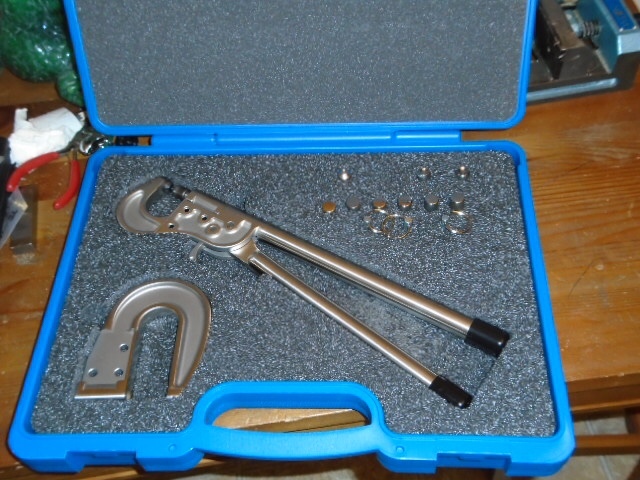 Chris, they are technically called pin clamps but everyone in the aviation industry knows them as "Clecos" which is a brand name. Part of me wants to call 'cheat!' 'cheat!' but I'm too envious. I'm taking a break from my hurricane prep so I thought I would try to get this build log caught up. After riveting the boiler I tried to solder it with my hand torch without success. I did some research on the forum and ordered a turbo torch setup. It is similar to the Sievert torches you guys use in Europe. While waiting for the kit to show up, I worked on some of the other parts. First up was the base. I faced the bottom flat and cleaned up the outside. The base was flipped and turned down to fit in the boiler shell. 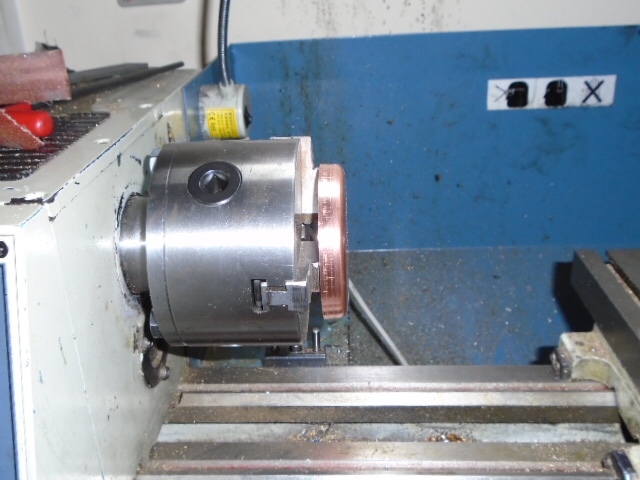 Then over to the mill where the mounting holes were drilled. 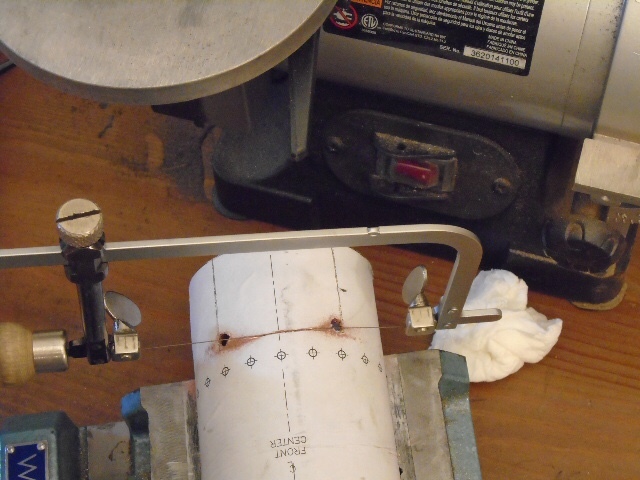 Then I turned the base on its side and drilled and tapped the mounting holes for the boiler shell. With that done I started working on the top cap. 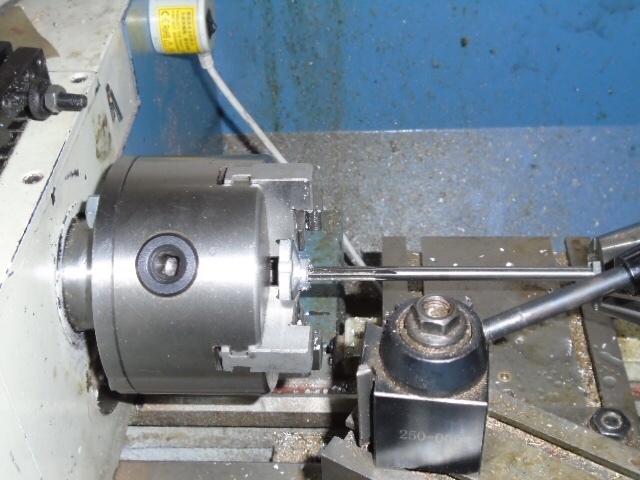 I mounted it into the lathe and turned the top part. Next I bored the top cap to take the chimney. The part was flipped and turned to fit in the boiler shell. 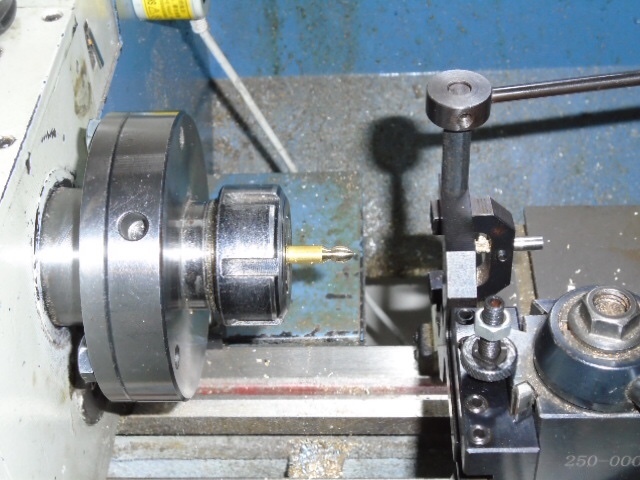 Then I put it in the mill to drill and tap the mounting holes and mill the recess for the safety valve. Next up was the chimney top cap. 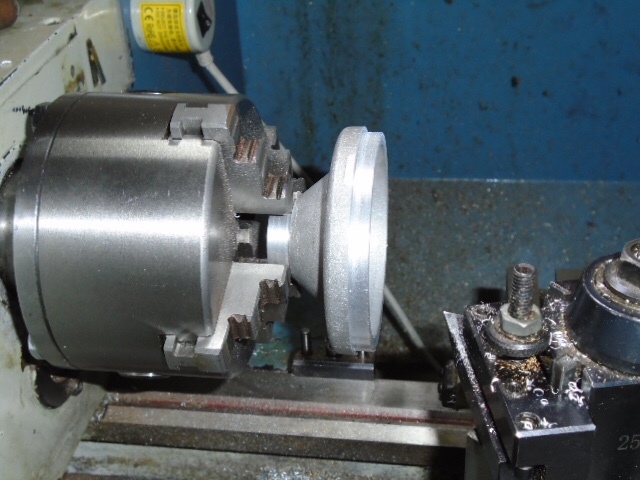 I started by boring the inside diameter and parted off. 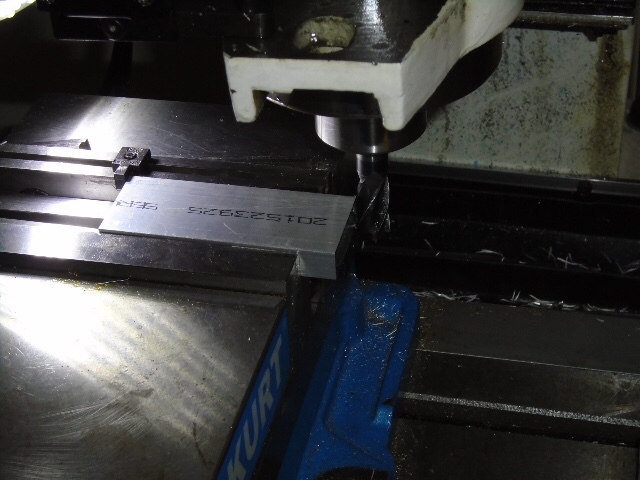 Then I made a form tool in some A2 tool steel and cut the final profile. 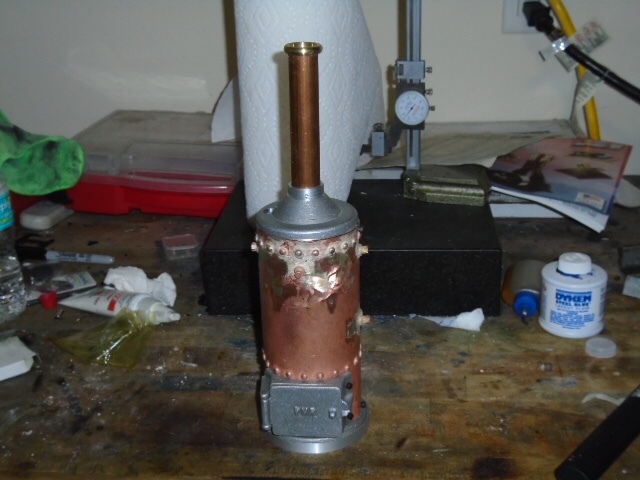 By this time my torch came in and I soldered the boiler. 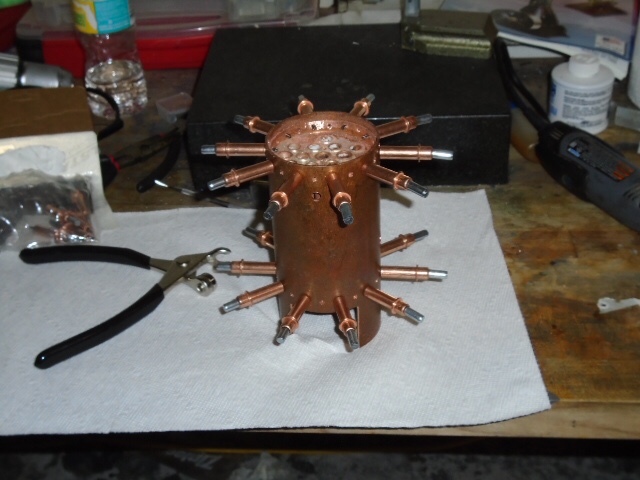 After soldering I pressure tested the boiler and found numerous pin holes and seeps. I'm still working to address those issues. Right now the boiler is on hold until after hurricane Irma. Definitely Tony. It looks like it may go west of you now but better safe than sorry. The boiler can wait a few days. Stay safe. I made it through Irene without any issues and thanks to the mandatory evacuations I had a few days off of work which I used to good effect. While waiting to work on the boiler leaks I made the door assembly. The door and door frame were filed until they latched together. Then I drilled the hinges in the frame. The door was slotted in and drilled via the frame. 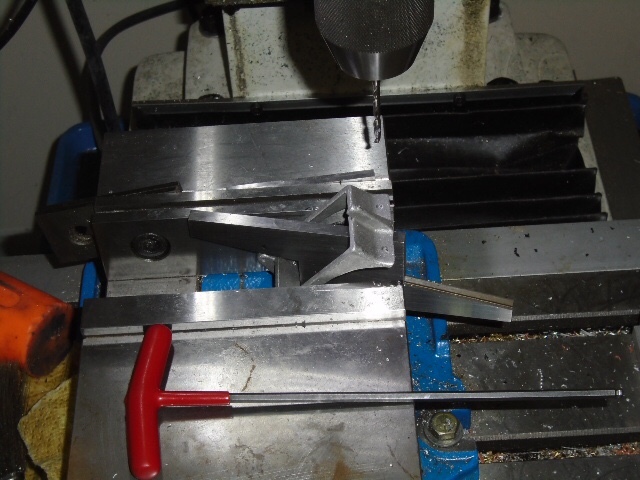 Next the mounting holes in the frame were drilled. 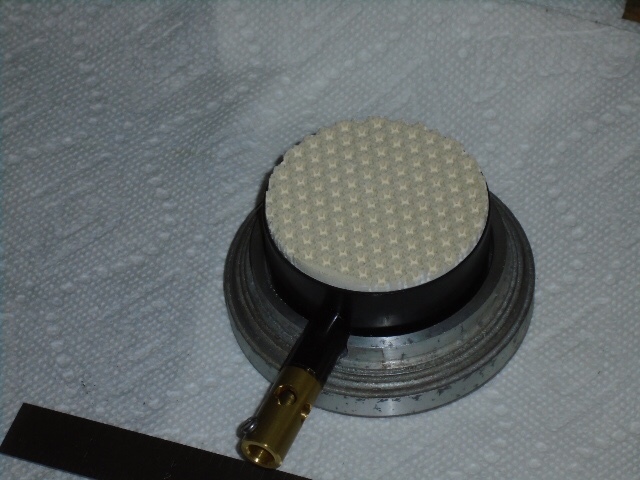 The frame was used to transfer the hole locations onto the boiler shell. 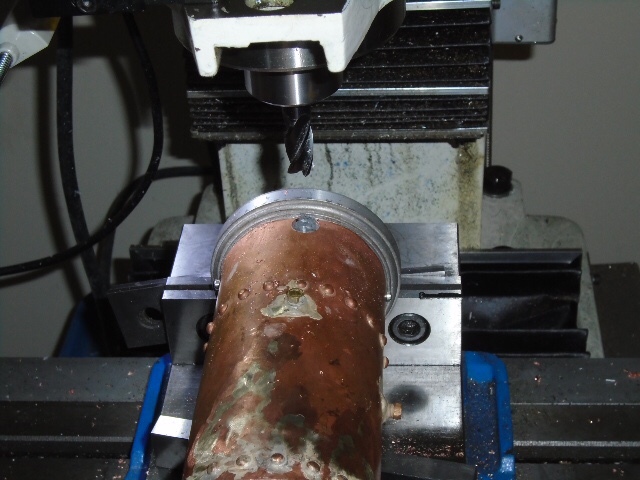 The boiler shell was then drilled and tapped. Back to the boiler. A friend of mine recommended a boiler leak treatment that is used on low pressure industrial heating boilers (less then 75 psi) to seal seeps. I filled the boiler with a 100 to 1 mixture of water and leak stop, connected an extension pipe with a pressure gauge and relief valve. (The extension pipe was to give some steam space to the completely full boiler) and fired it up on esbit tablets. That stuff worked like a charm. All of my seeps were sealed. After it cooled down I spent the next two hours cleaning up the esbit residue. I'll never use that stuff again. Here is a pic of the boiler ready for paint. I'm going to hold off on painting it until my gas burner comes in incase I have to make some modifications to fit it in the boiler. So with the boiler out of the way, I started on the generator. 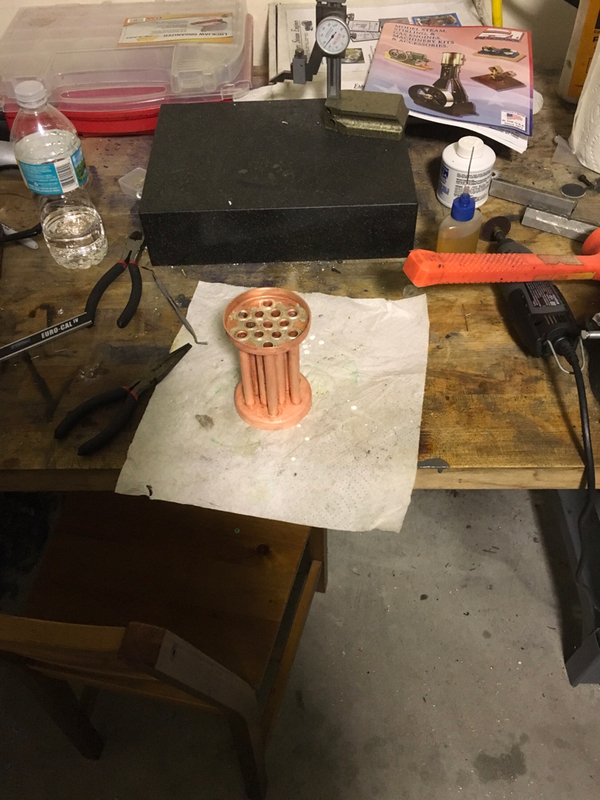 The first part is the base casting. I milled the base flat. I put the base in the four jaw and faced the end. 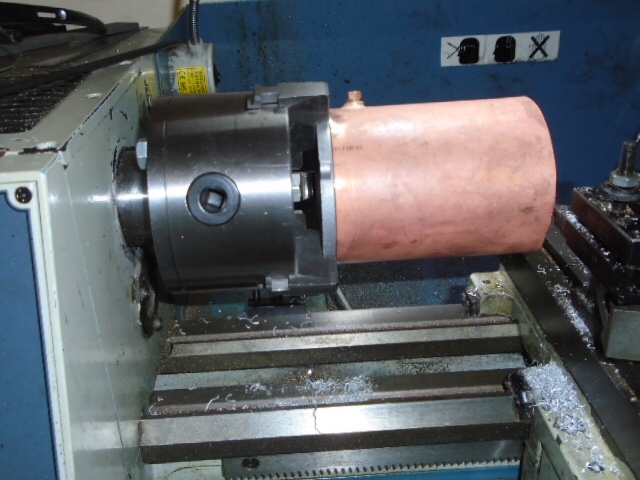 My original plan was to bore the casting on the lathe but I wasn't happy with the security of the part in the jaws. 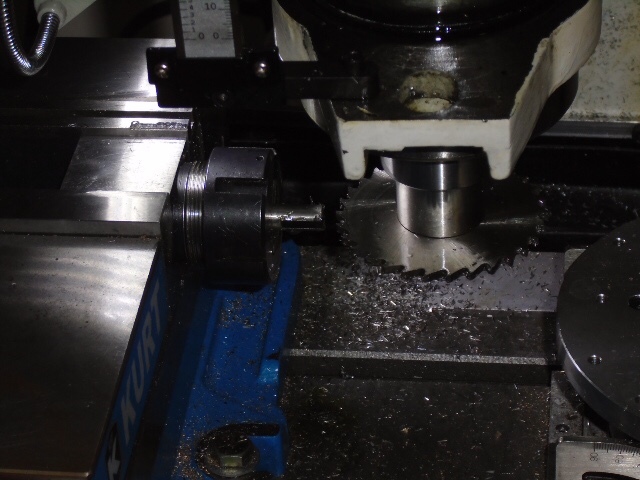 I decided to do the work in the mill. First I spot faced and drilled the top hole. 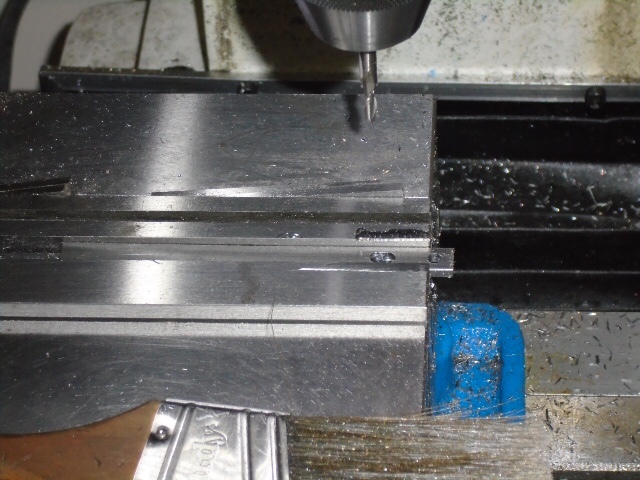 Then I milled the sides level. 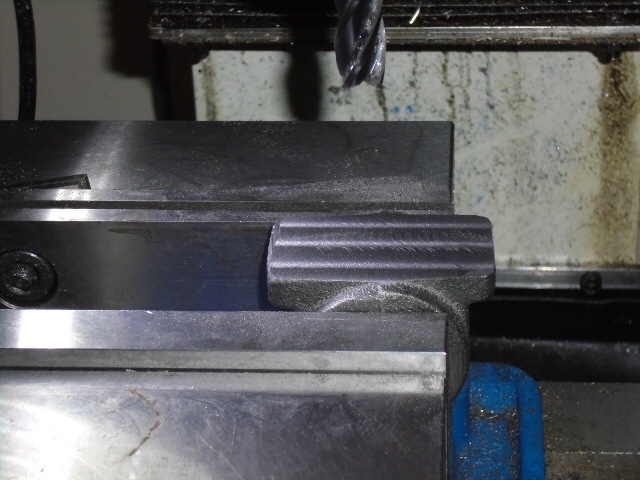 Then with the previously faced side on parallels I milled the other end flat and bored out the casting. 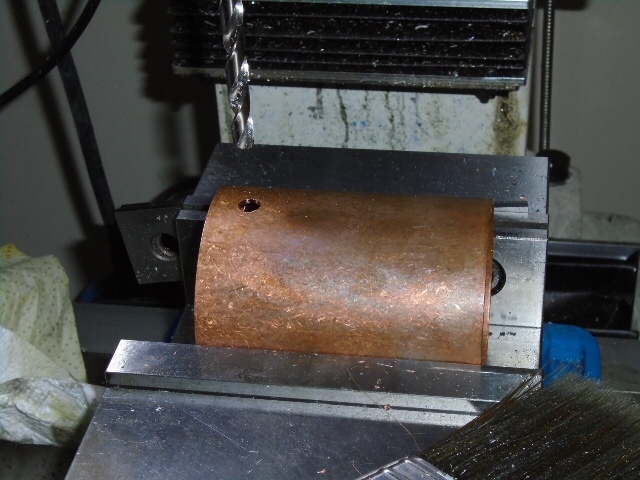 It was the first time I had used the quill power feed and it left an amazing finish to the bore. 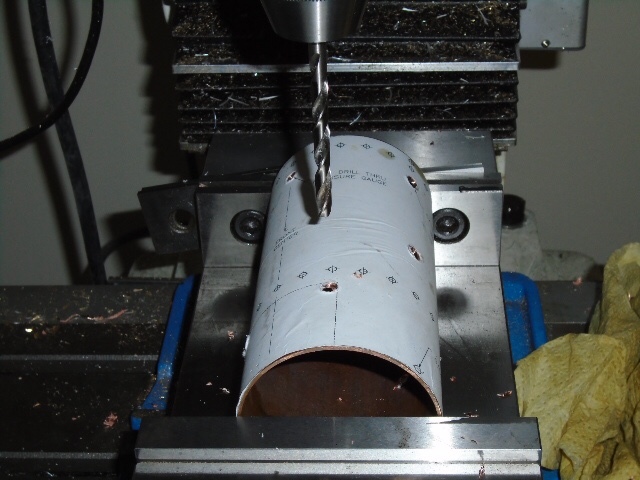 Then the holes for the end caps were drilled and tapped. At that point I realized that I had forgotten to drill the mounting holes in the base so that was taken care of. That completes the base casting. Next up is the back end cap. 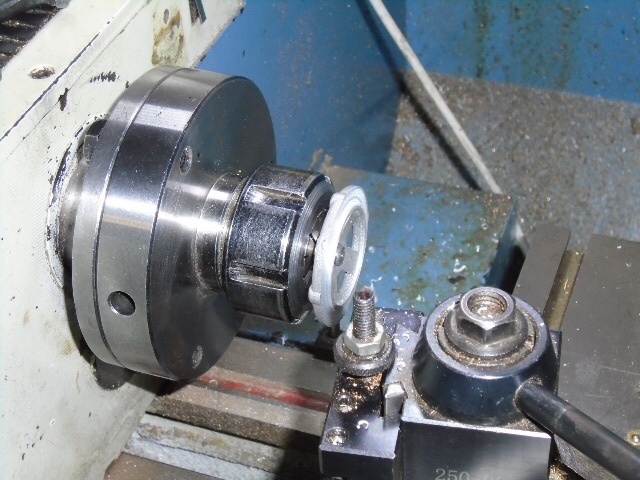 Both ends of the casting were faced in the lathe. 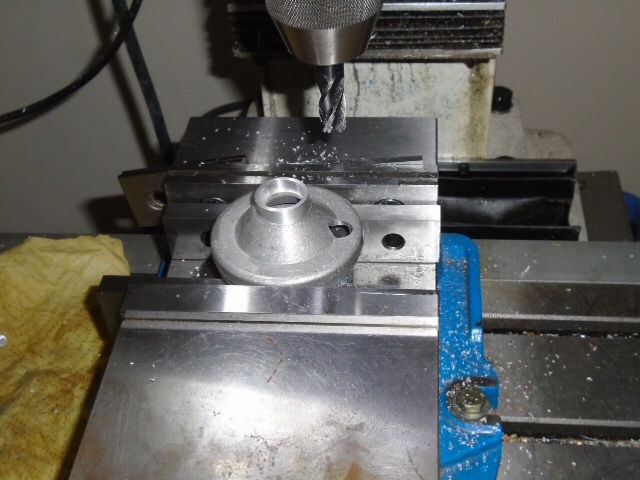 Then the center hole was drilled and reamed. 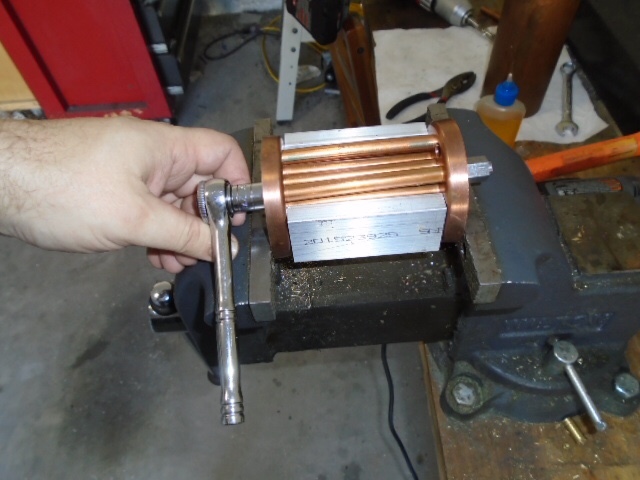 The part was Locktited onto a mandril, trued up and turned to fit the bore. 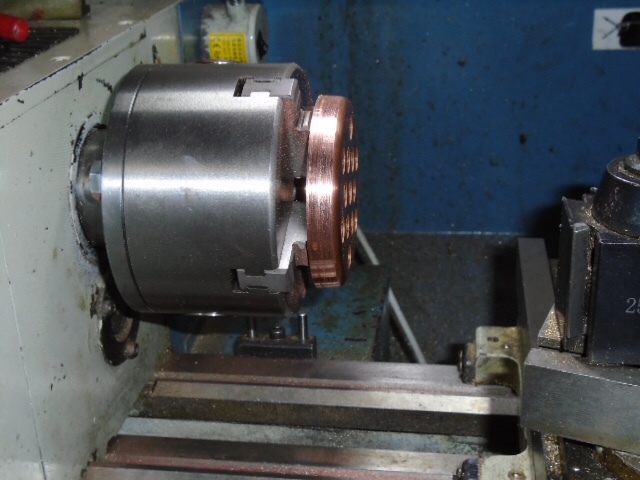 Next the end cap was put in the mill and the mounting holes drilled. I'll end this segment with a generator family shot. Time has been in shot supply recently but I have made some progress. The next part to be made was the end cap with the brush holders. I started by cleaning up both faces and then drilling and reaming the bearing holes. 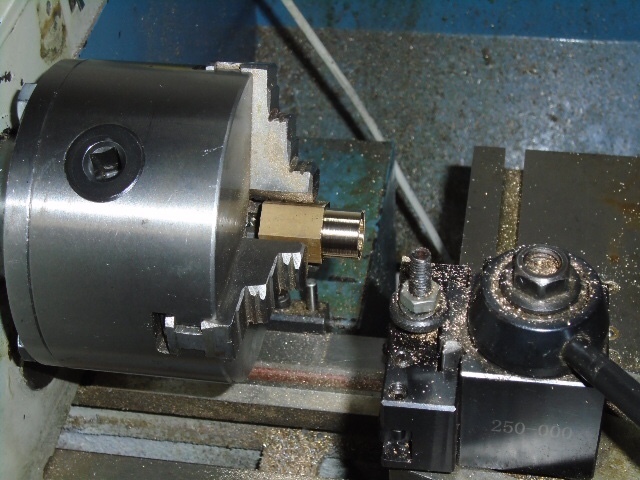 Then the part was put into a collet block in the mill and the holes were drilled. 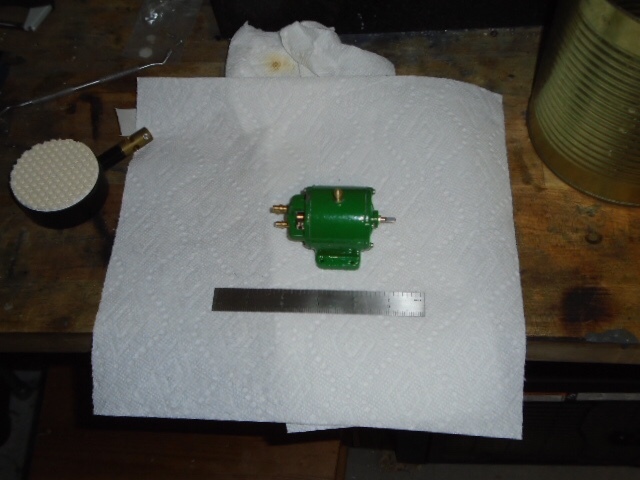 After removing the end cap from the mandril, I started on the magnet spacer. 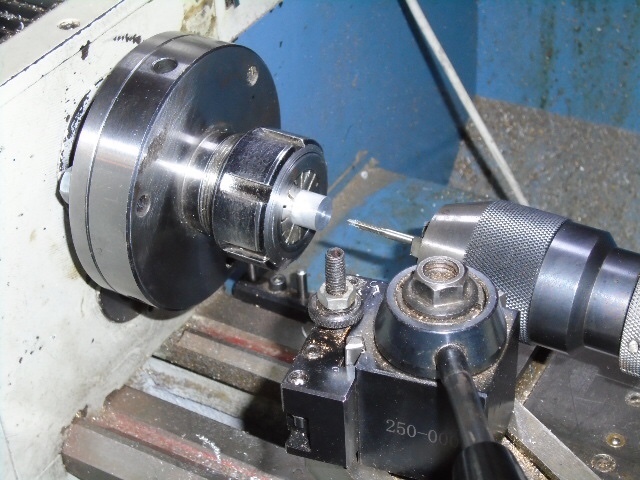 This is a simple aluminum turning that was threaded in the middle. Next up was the pulley. The shape was turned and then drilled for a grub screw and parted off. 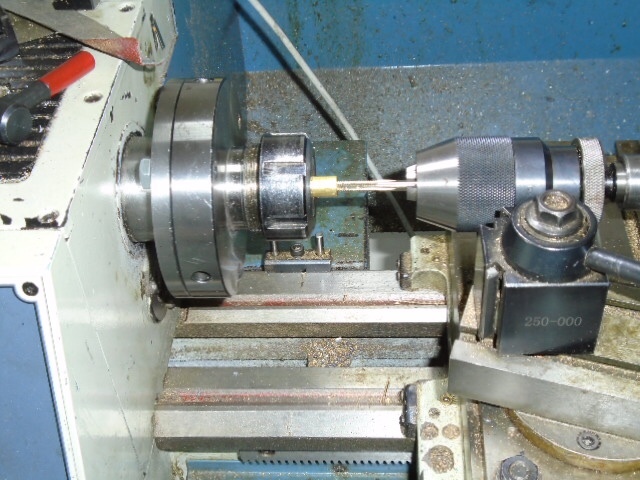 The following part was the screw that holds in the magnet separator. The plans call for a lifting eye but I didn't care for the look so I made a decorative turning. And then threaded the other end. The last 2 parts for the generator were the terminal screws. Since they have to have the same shape I made up a form tool and cut them to shape. Then they were threaded and parted off. The castings were painted and assembled leaving me with this. Under test, it produced 22 volts unloaded at 2000 rpm. At the same time my Bix burner came in. 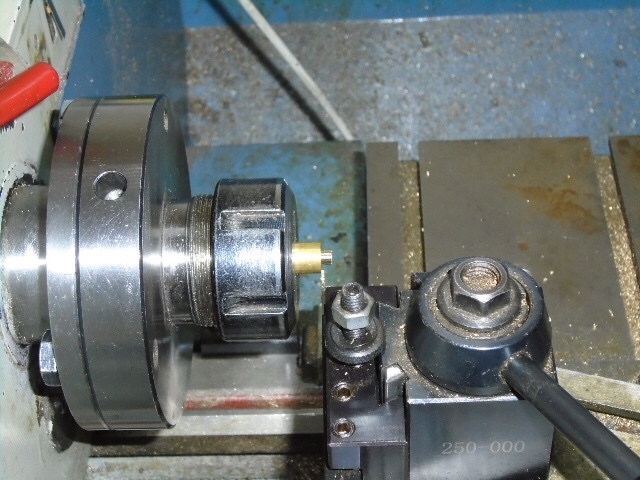 I took the opportunity to mill a slot in the boiler base for the feed end. Then I transferred the hole to the boiler shell and filed to fit. Here is a family shot of all of the components except the boiler. 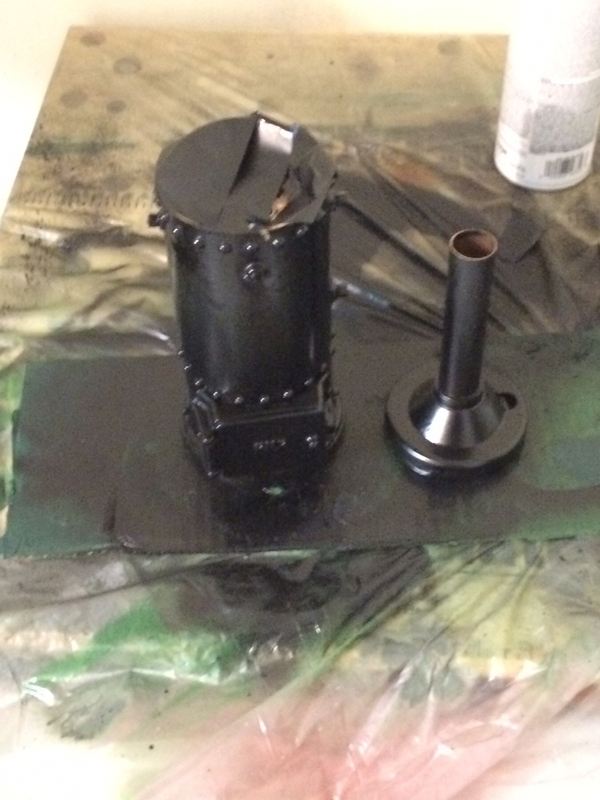 Here is the boiler in paint. I need to come up with a base and then I can start final assembly. Thanks Bill, Oddly enough one of the design requirements is that it has to sit nicely in the center of my chief engineer's round conference table and somewhat match the decor. I think I might have failed on that last part of the requirement. Thanks Perry, I'm planning to use a buck converter to take advantage of the higher voltage. Now my challenge to you is can you get your setup to charge an iPad? Time for a quick update. I found and (badly) finished a small wooden tabletop intended for a nightstand to be the base. All of the components except for the generator and buck converter are mounted. I am in the process of plumbing everything together. As so often happens, I am short a few fittings and the o-ring I am using as a drive belt is to short. While I wait for my missing components to arrive, I decided to try to figure out what to do with the exhaust and condensate. Since the plant is intended to be operated in an office environment, I needed something that could be removed and easily emptied into a sink. That means that a hard mounted condenser was out of the question. 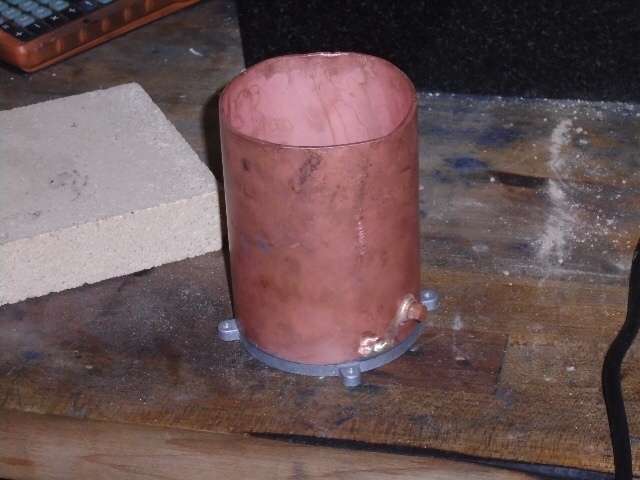 My original thought was to make a brass chuff pot with a removable condensate tray at the base like Wilesco uses. Then it occurred to me. Why does it have to be brass? The Wilesco tray is plastic. Why can't I make mine out of plastic. I have a 3D printer and I need to work on my Fusion 360 skills so why not. After much head scratching and YouTube referencing I came up with this. It's hollow and the hole in the side is where the exhaust and blowdown pipes will insert. Then I hit the next problem. 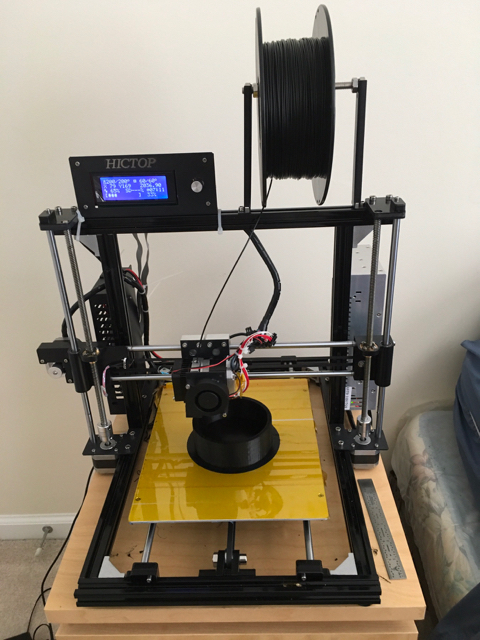 The part was two tall for my 3D printer. With some more head scratching and YouTube videos I split the assembly into two parts. 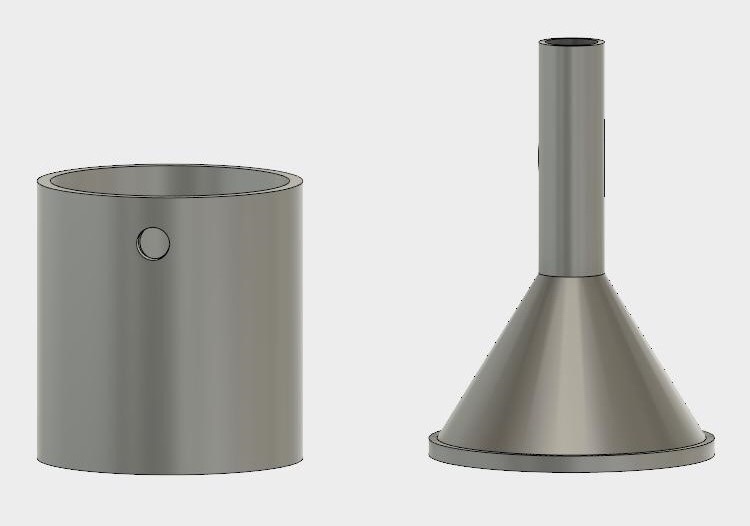 Each of the parts will be printed individually. This actually turned out to be a good thing. When I imported the files into my slicer I realized that there would have been no way to remove the support material from the inside of the shape. When the components are complete I will paint them with epoxy to seal them and we will see if it works. I would have just piped the condensate over to the boss's coffee cup!! He's an engineering heretic. He doesn't drink coffee. Niether did I - though I did consume mass quantities of cola! Though if I ever started to grow pointy-hairs (you Dilbert fans will get that one), I would have shaved my head and stuck it in a furnace! It's done and it works (sort of). The 3D printed condenser actually worked. I did learn a few things along the way. 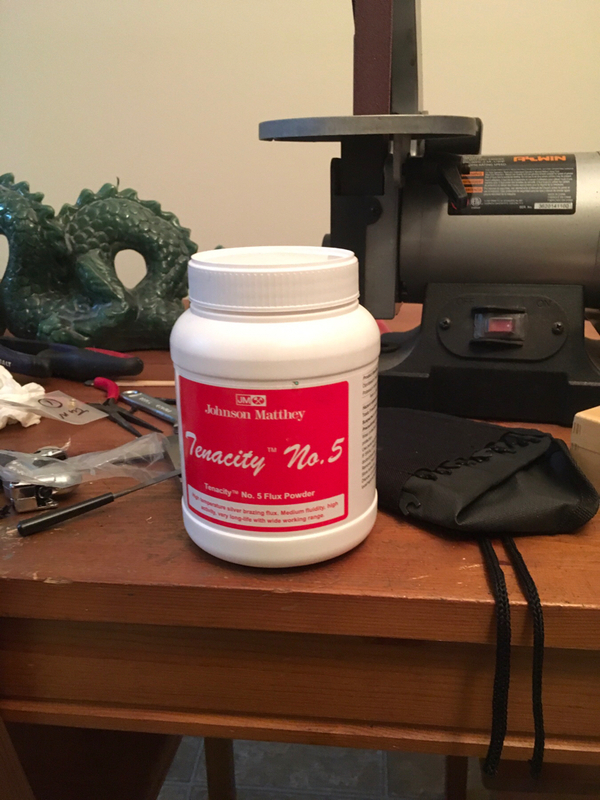 If you are going to make one, don't epoxy the inside. The epoxy will melt when exposed to the exhaust steam. (It made a huge mess on the board that I can't completely clean up without damaging the finish.) The PLA is watertight on its own and has no issues with the temperatures required.. You can epoxy the outside for appearance purposes with no issues. Here is the link the the completed plant in the showcase. Bad Behavior has blocked 16064 access attempts in the last 7 days.